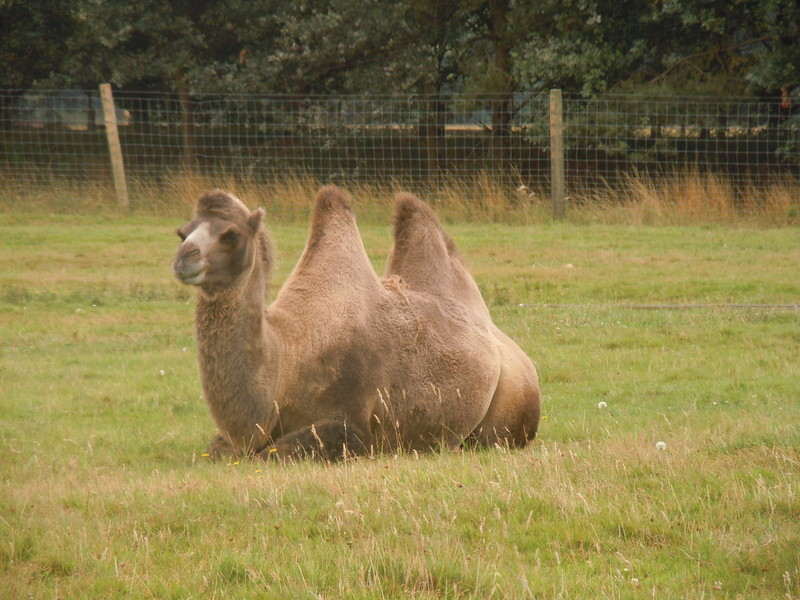 Woburn Safari Park is a safari park located in Woburn, Bedfordshire in the UK. 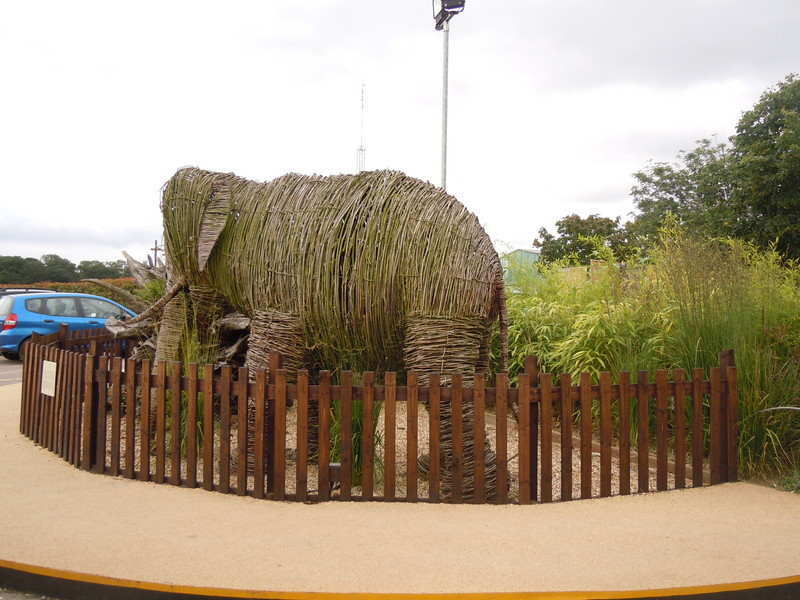 Visitors to the park can drive through the large animal exhibits, which contain species such as White Rhino, Elephants, Tigers and Black Bears. 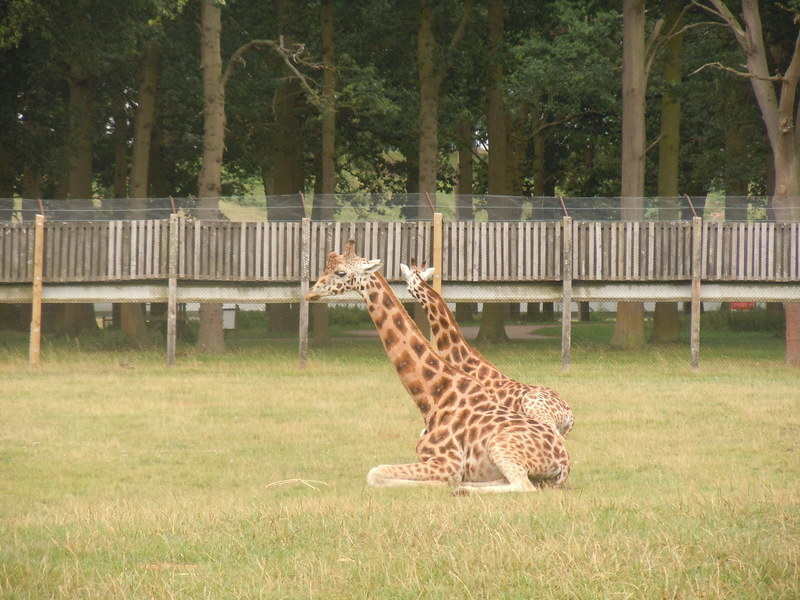 Woburn Safari Park first opened in 1970, established by the 13th Duke of Bedford on the grounds of his estate, Woburn Abbey, as a means to help improve the financial position of the estate and restore the Abbey, which had fallen into disrepair during the second world war. 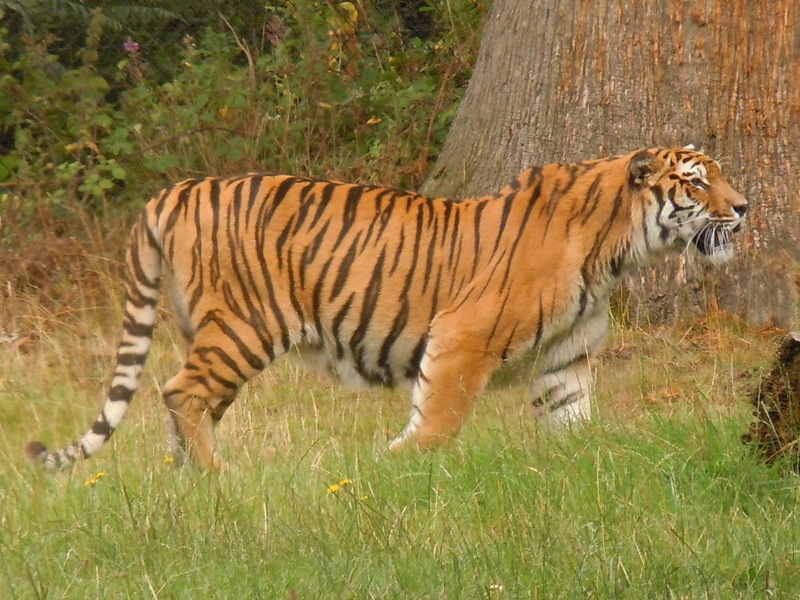 The 11th Duke of Bedford had been president of the Zoological Society and had introduced various species such as American Bison, Deer, Antelope, Lion and Tiger to the park. Squirrel Monkey in the walkthrough, in the Woburn leisure centre. 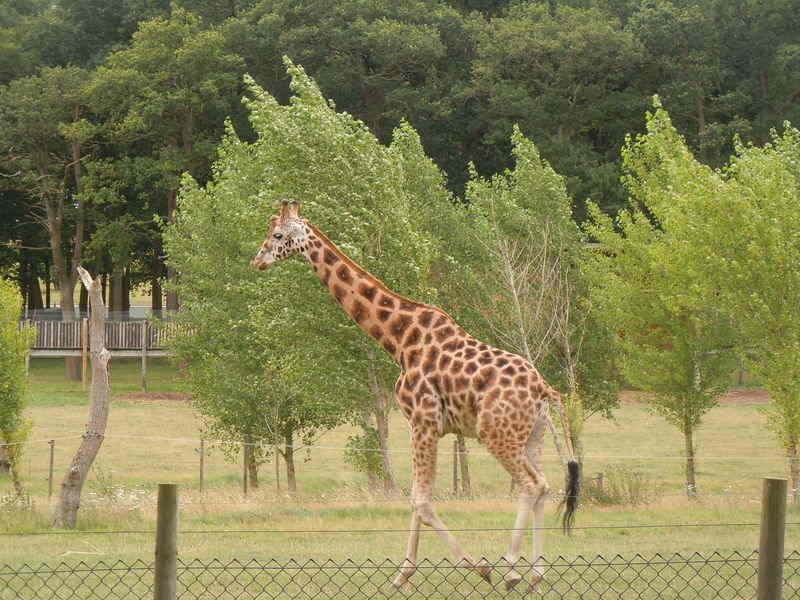 Rothschild Giraffes are almost extinct in the wild, but Woburn has many. 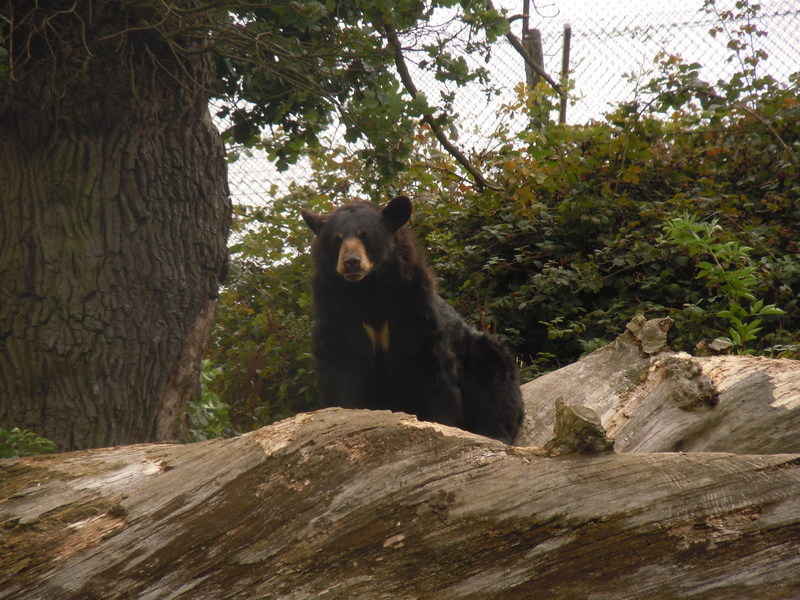 The park enables animals to roam freely while visitors drive through their enclosures. 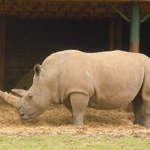 The species held in the park include Rhinoceros, Eland, Scimitar Horned Oryx, Lechwe, Gemsbok, Giraffe, Ankole, Zebra, Elephant, Camel, Bison, Bongo, Lions, Tigers, Wolves, Black Bear, Drills and Patas monkeys and Barbary apes. 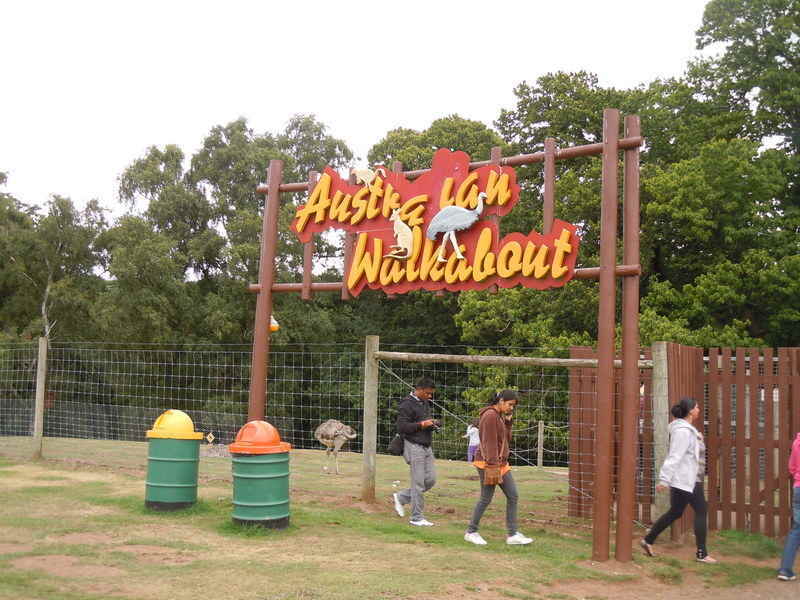 Animal in the leisure park include lemurs, squirrel monkeys, wallabys and emus, penguins, goats, ponys, seals, reptiles including snakes, and some free ranging marmosets. 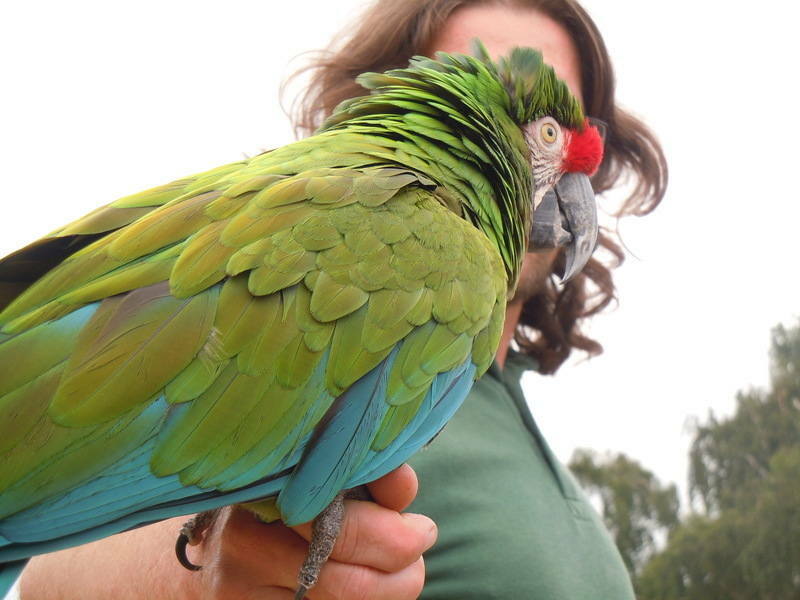 The park is committed to animal conservation and is involved in international breeding programs to help save endangered species. 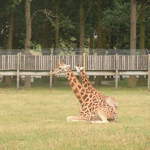 The park has had recent success (October 2006) breeding Rothschild Giraffe, an endangered sub-species of Giraffe. 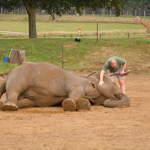 In recent years under the management of Dr Jake Veasey, considerable progress has been made to enhance Woburn Safari Park's conservation activities. 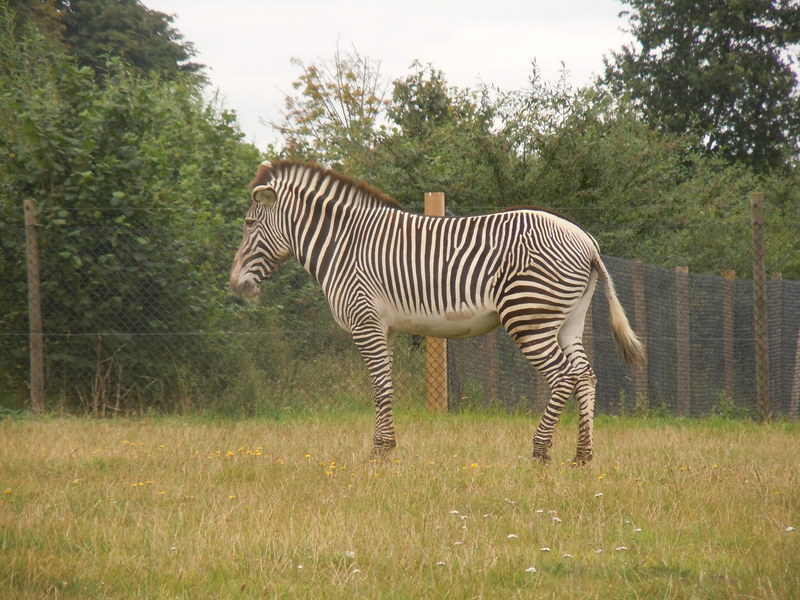 Woburn Safari Park manages the Eastern Bongo breeding programme in Europe, one of the rarest large mammals in Africa, and has recently constructed one of the world's largest hoofstock facilities; the African Ungulate Conservation Centre. 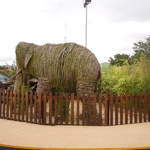 Most recently it has constructed an innovative Asian elephant facility designed by Dr Veasey. 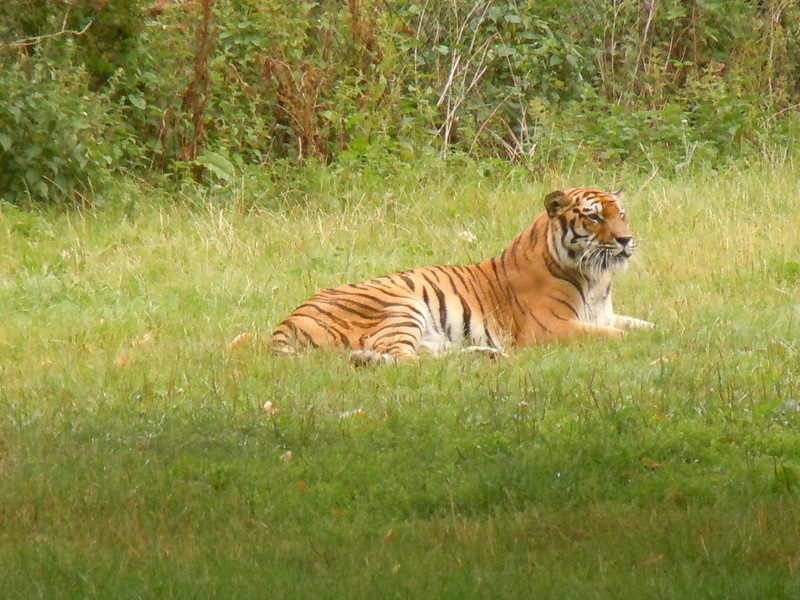 In 2007, Woburn Safari Park become the largest fundraiser for EAZA's Madagascar in-situ conservation campaign. 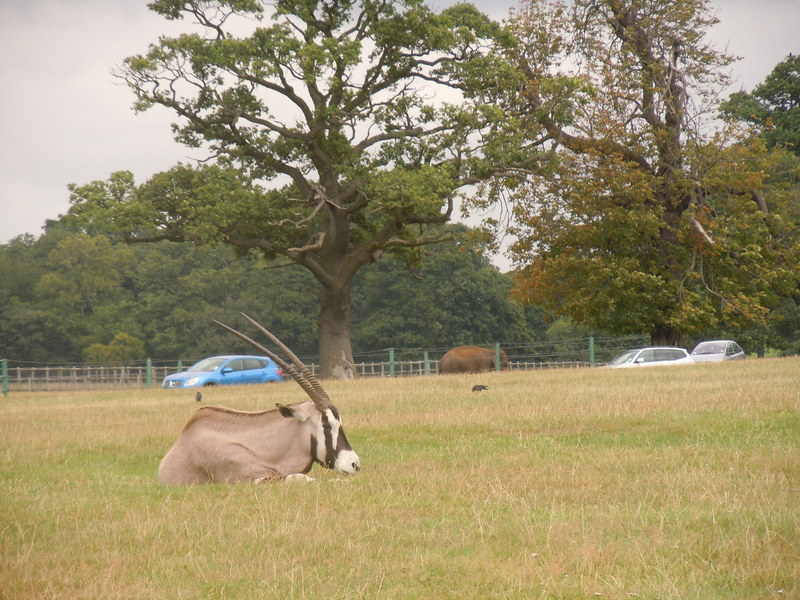 Other features of Woburn Safari Park include an African Ungulate (hoofed animal) Conservation Centre as a focal point for conservation and breeding programs for endangered African species, believed to be the largest such facility in Europe. 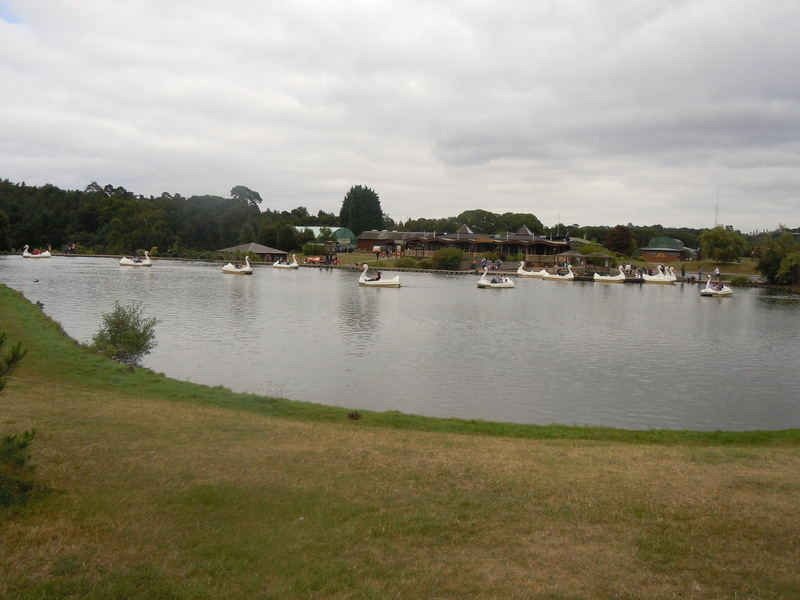 The park also has a 40-acre (160,000 m2) leisure area featuring an Elephant Encounter area, Sea lion Displays and Birds of Prey demonstrations. 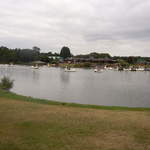 There are also play facilities for young children, a large gift shop and a restaurant. 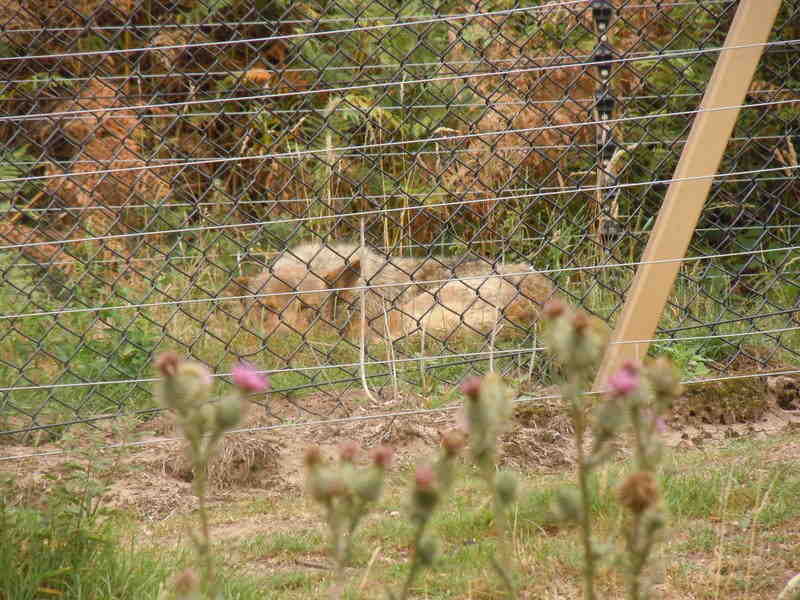 Unknown to many visitors, there is a public footpath that runs along many of the animal enclosures. 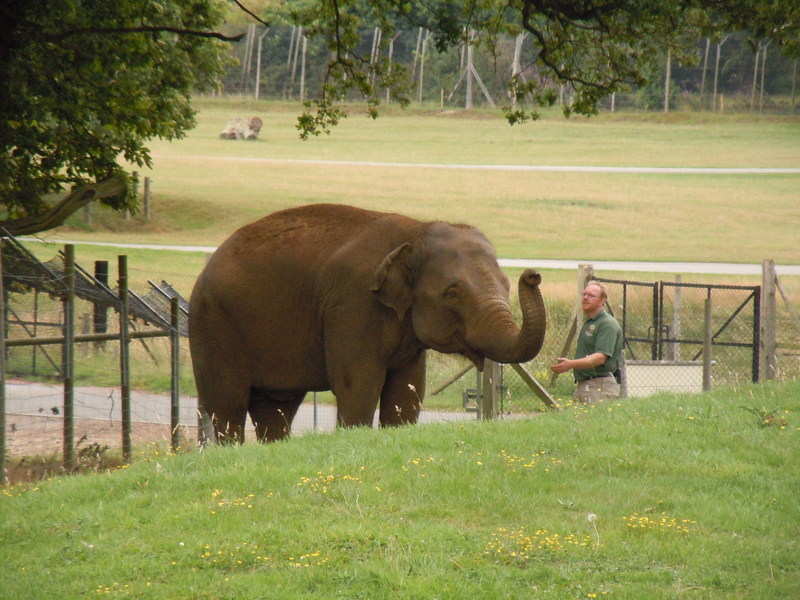 From a short distance you can view many of the exhibits, such as elephants for free. Woburn Safari Park is part of the Duke of Bedford's estate and when combined with the acreage of the deer park which surrounds the safari park (home to the endangered Pere David deer), it represents the largest ex-situ conservation facility in Europe and the first 'captive' breeding facility to rescue a species from extinction in the wild with its success with the Pere David deer. Woburn was also instrumental in saving the Mongolian wild horse. 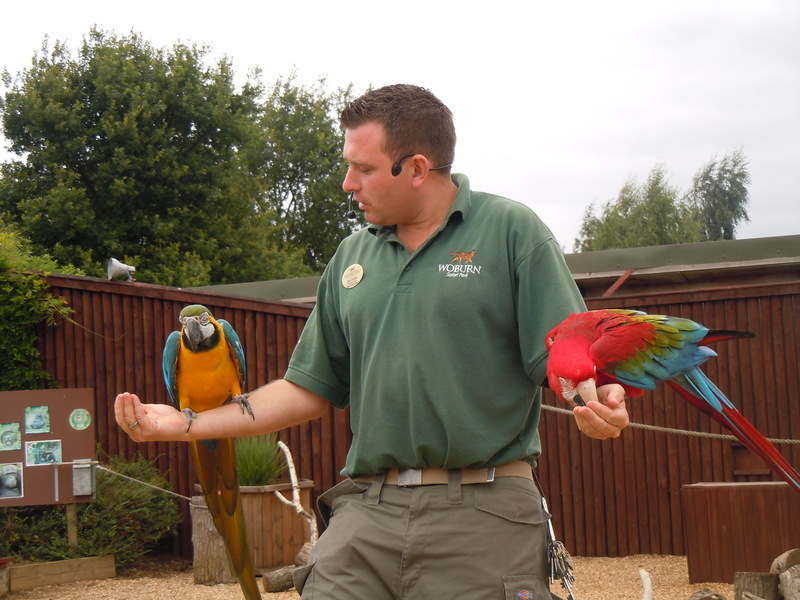 Currently Dr Jake Veasey of Woburn Safari Park manages the European Endangered species Programme (EEP) for the critically endangered Eastern Bongo. 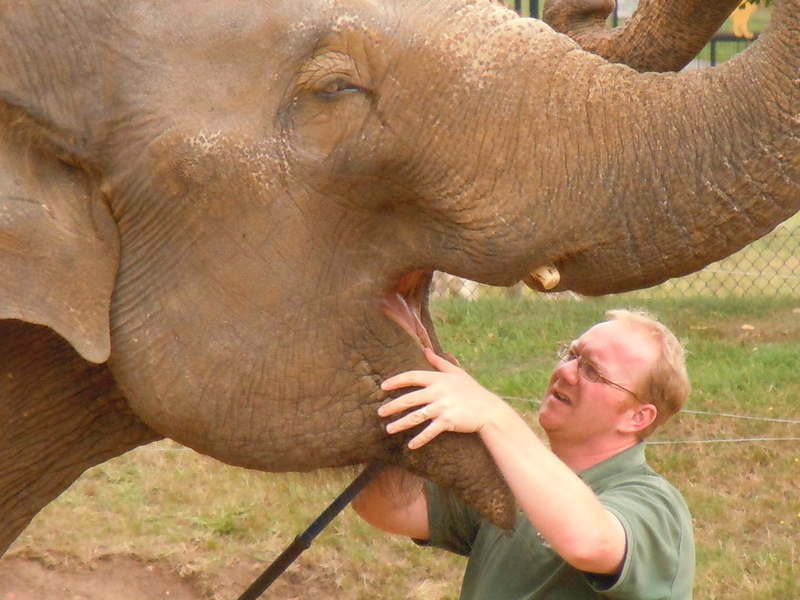 In 2008, Woburn will open its new Asian elephant facility which boasts numerous innovations to optimise elephant welfare and conservation. 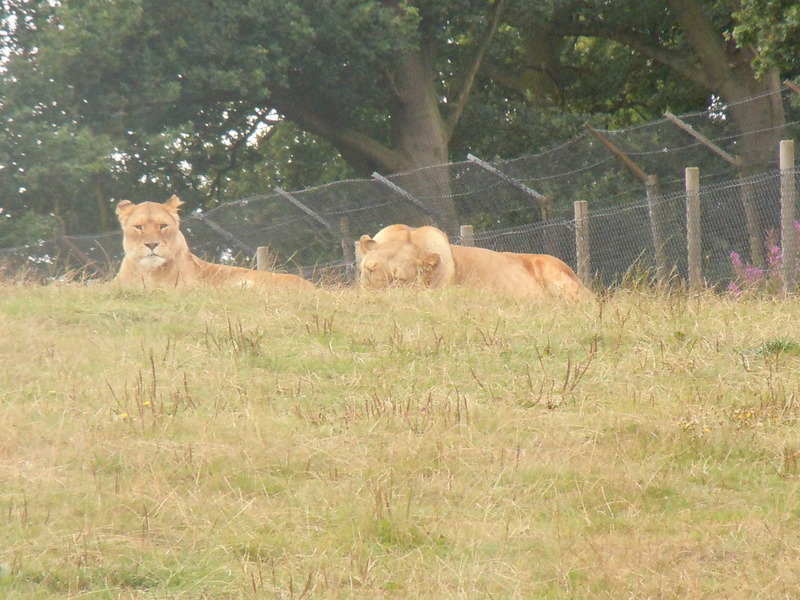 Roaming around in Woburn Safari was an absolutely awesome experience. It was the first time in my life when I found myself in a moving cage(in my car, lol) whereas all the wild animals were freely wandering around me ! 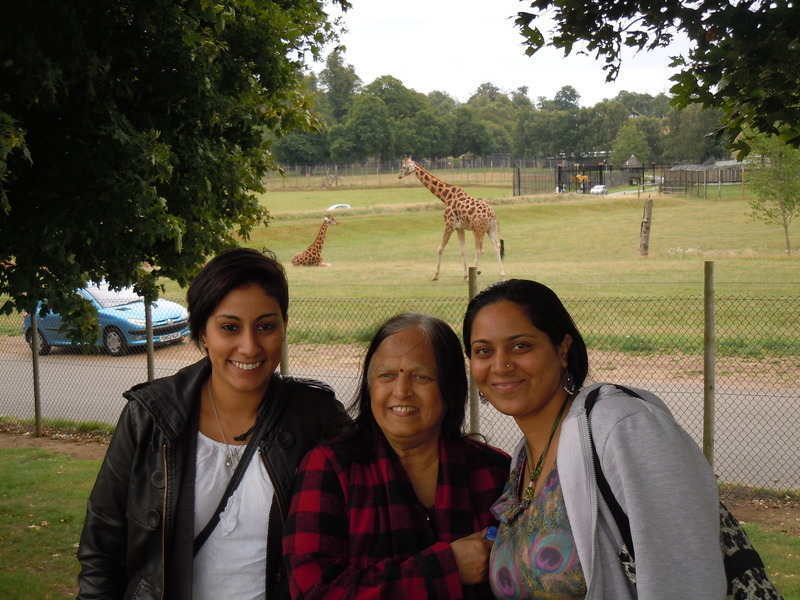 We saw different wild animals having origins from all over the world and some were from my country, India. The entry ticket was 20 pounds. We were 7 of us. The opening hours are - morning 9 to 5. The ticket booths are a bit inside after one enters the main gate. There were 2 to 3 small queues of cars for buying the tickets. 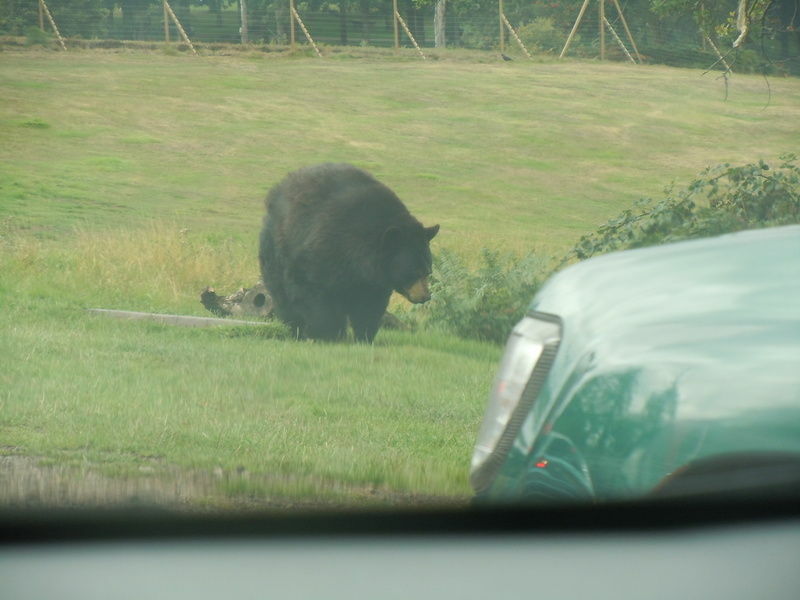 Once we bought the tickets and got in we drove slowly along the other cars in the queue and almost immediately started spotting animals. 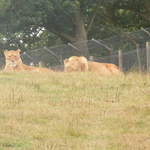 One good thing about the Woburn safari is that it is made in such a way that one hardly misses any animals. The reason being, the separation of different species of animals into different locations and these locations being isolated from one another using gates. 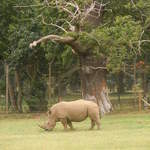 As soon as we entered, we spotted rhinos and a peculiar kind of animal which looked like a deer and was white in colour with curled horns. 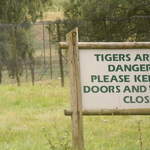 Then we came across a caged gate which had images of tigers on it and read tigers are dangerous animals. 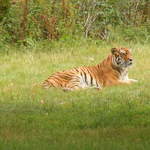 After a few minutes of us entering the gate we spotted a tiger not very far from us. It was munching on a big piece of meat. 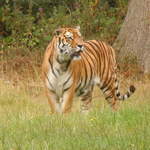 On seeing the tigers, the queue of cars slowed down to take pictures of the beautiful animal. 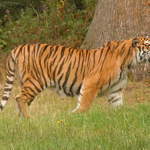 Luckily after sometime we spotted a second tiger approaching the first one. 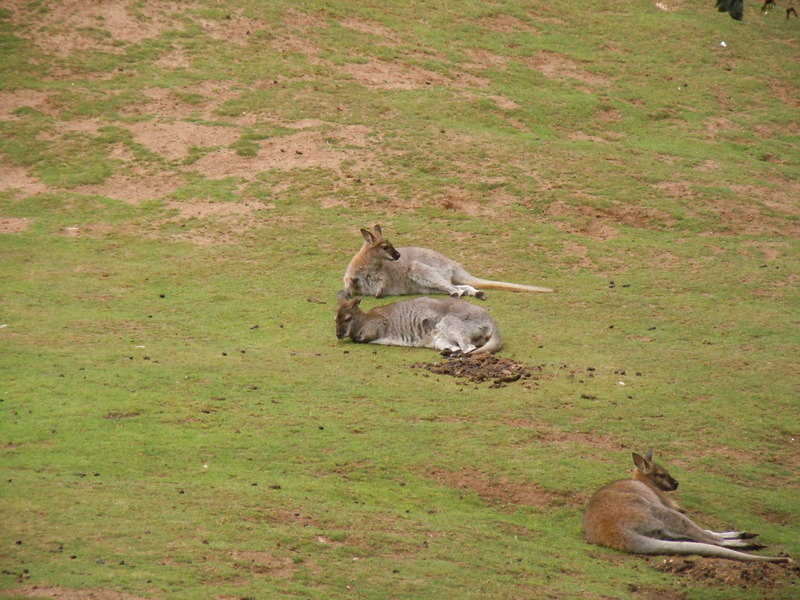 They were quite relaxed and didn't seem to mean any harm. 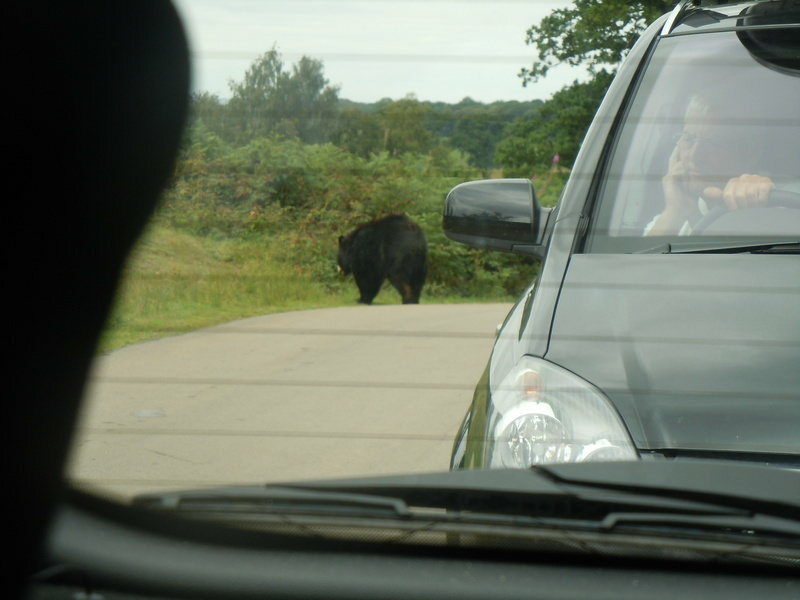 However the people who were too keen to get a good picture and hence opened their car's windows were very cautious. 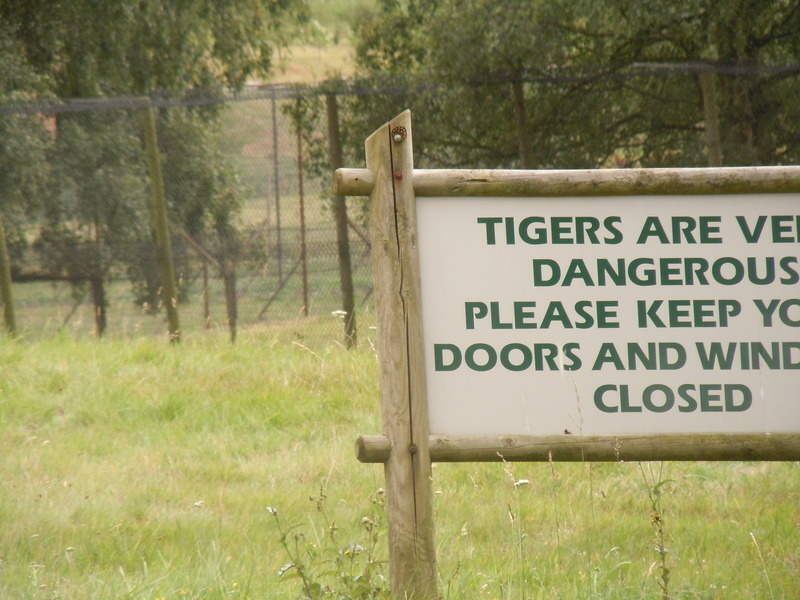 I guess there were only 2 tigers. However they were very well visible and could be spotted easily due to the way they were placed, as mentioned previously. There were exit gates to go out of the tiger's arena. The arena was pretty vast. 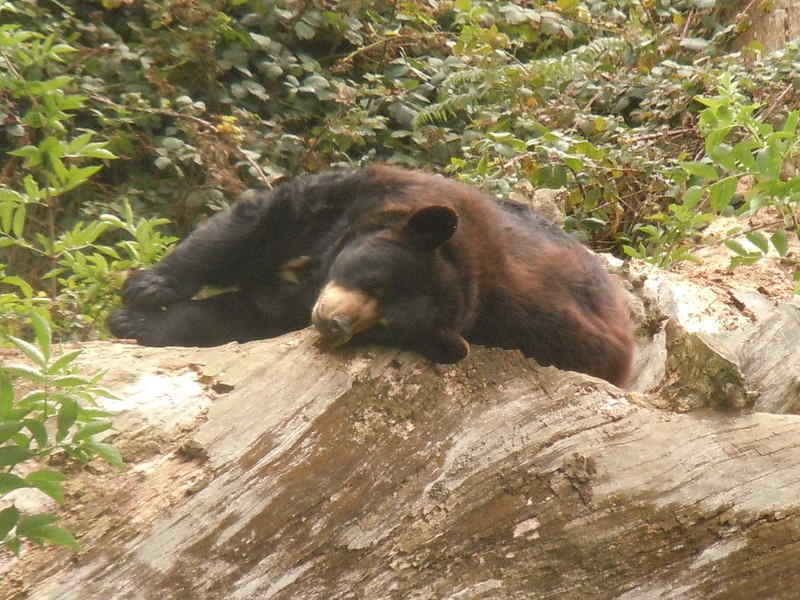 We spotted 2 bears out of which 1 was lazily yawning and the other seemed to have just woken from his sleep. 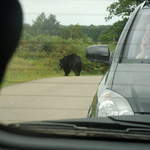 The latter crossed the road just behind the car which was behind us! 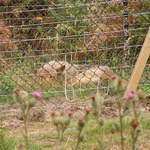 As we slowly moved ahead, we spotted a wolf which was fast asleep. Then came a bunch of around 10 Lions. They were in a group. I couldn't capture them in pictures properly as they seemed to be on a platue and the road was going down hill adjacent of the platue. 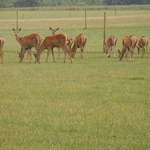 But still, I managed to capture them quite well. 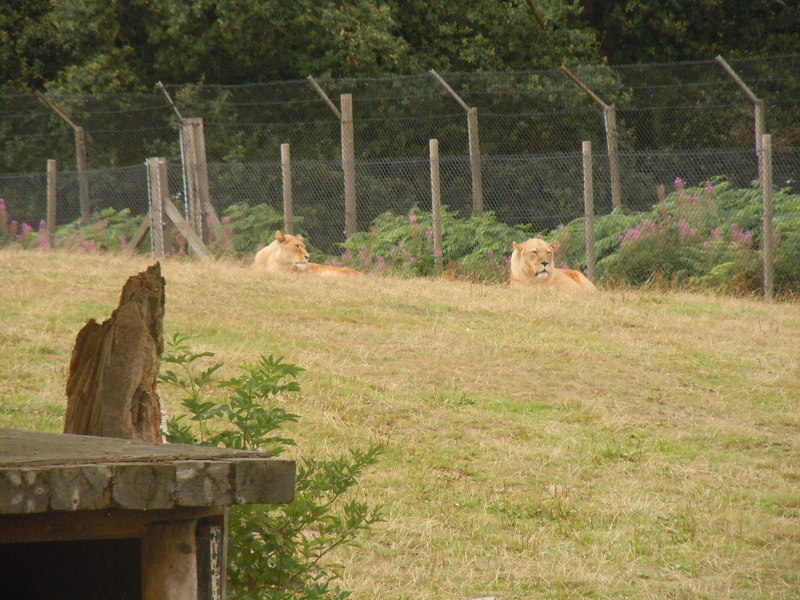 I don't remember if there was a gate which separated the Lions from the next animals we saw. 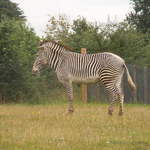 But I think there must be one as we spotted Zebras. By the way I think it would be inappropriate to use the word "spotted" as they were right in front of our car blocking our way ! They were so beautiful with the crisp black stripes on the white background. 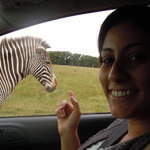 I remember telling Holly, who was driving, that, they usually run in herds randomly, when chased, so that the predator gets confused watching the motion of stripes which forms some kind of optical illusion ! 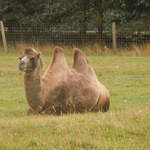 After this we saw some peculiar double humped camels. They were a bit shorter and darker from the ones I saw in India. 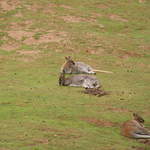 I think I also saw some huge hirsuite cow link animals and then Jirrafs. Before the arena where we found Jirrafs, there was a diversion which led into another arena which I believe contained Monkeys. However, we did not go that way. After finishing the safari by car, we parked the car in the parking area which was huge. 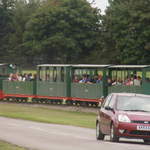 We also saw a mini tour train. 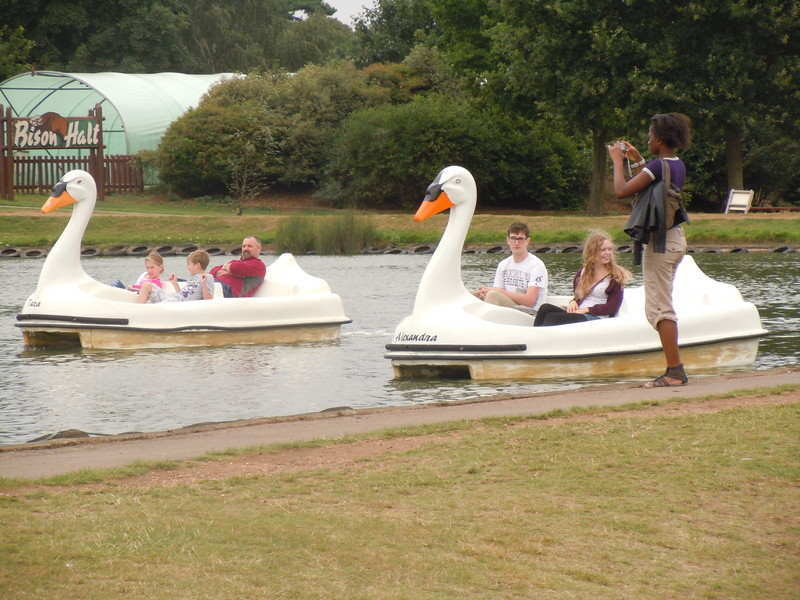 There was a small lake in which people were sailing on boats which were made like ducks. We took a break near the lake and as we were hungry by then, we had some sandwiches, fruits and chips. Ravi had prepared the mint / Pudding chutney to be spread on the bread along with butter n grated cheese and slices of tomatoes. After this we took a look break in a cafe adjacent to the lake. After this we went to an arena which is called "Birds in action". It was a circular arena with sand in the centre and one semicircumference contained stairs for sitting and the other circumference was used for the show. This was showed by 2 men American was a splendid show which consisted of 2 or 3 very beautiful birds called kakakuas and parakeets. They were very well trained. The presenters presented the show very well with a lot of humour in between. While buying the tickets, we were handed over with a map of the safari with the whole schedule. We were following the schedule and would recommend you to do it as well. I don't quite remember if we missed anything, though we started a bit late. 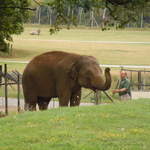 After "Birds in action", we headed towards the Elephant show. 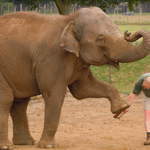 2 Elephants were brought into a muddy arena in Thurdays open. 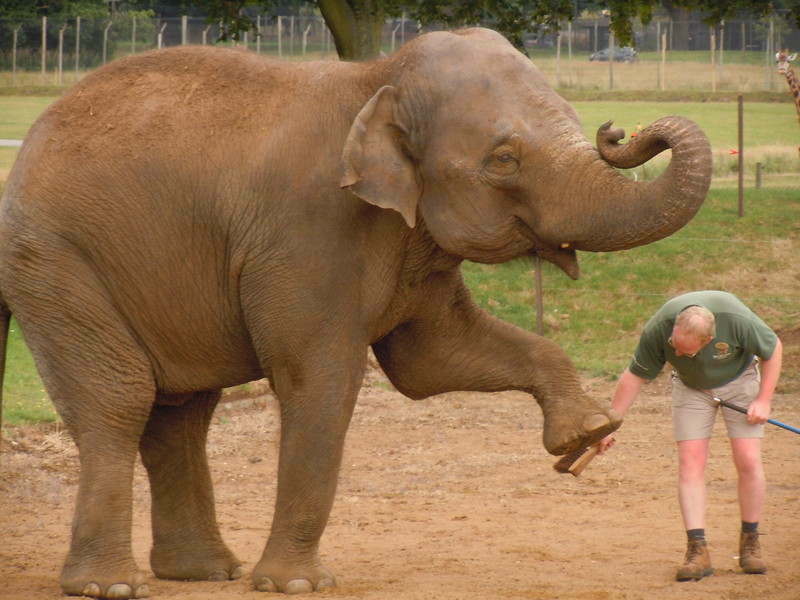 As far as I remember, both the Elephants were brought from India. One of them was called Raja which means King. 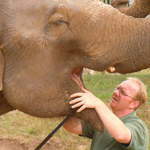 In all the shows in Woburn Safari, the presenters were very well spoken and very well equipped with good audio equipment. While presenting they also mentioned how animals and birds were in danger of poaching and other various things and requested the audience to donate money so that they could use that money in the favour of the endangered animals and birds. 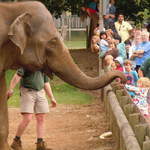 The Elephant show was also very entertaining and popular, where the Elephants showed off their skills. It was a full house. I don't quite remember the sequence in which we attended the shows. 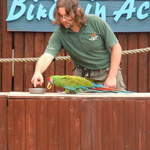 We also attended a carnivorous bird show. 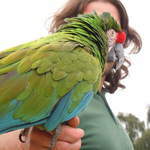 2 girls with mics demonstrated the skills of the birds and they provided a lot of information about the birds. It was in one of these sessions that I came to know that the eye balls of the owls don't rotate like ours or like other animals. Hence, rather than rotating the eye balls, they have an incredible ability of turning their heads in very high angles, if not 360 degrees ! This is how they spot their preys and food. Towards the end of the of the show, Shruti, Lipika, Prachi and my mom headed to watch the Penguin and the seals show. However since me and Ravi stayed at the carnivorous bird show, we got late for the Penguin show ! However we managed to see some tiny penguins. I don't quite remember seeing dolphins there. 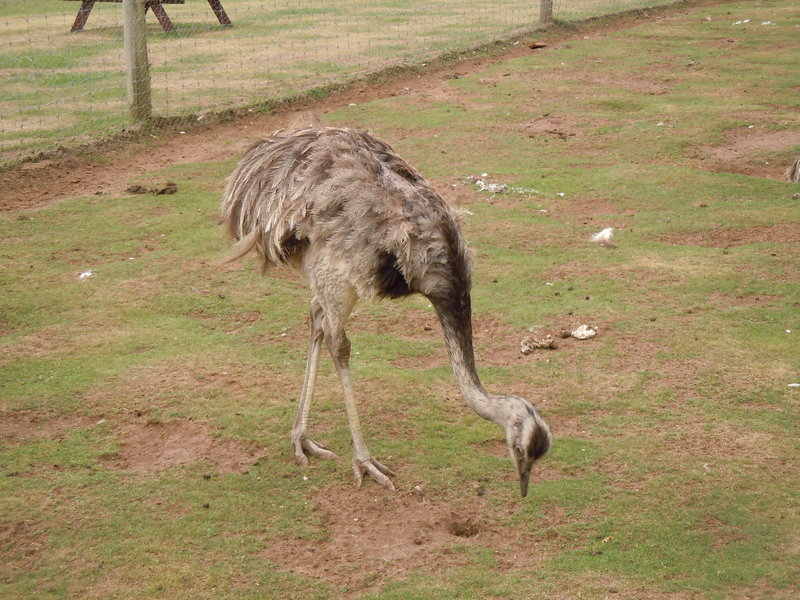 I don't quite remember when, but we also saw Ostriches and loads of Australian Kangaroos in the open. 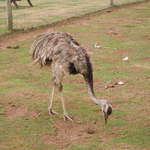 I remember telling Holly that that the largest cell in the world is nothing but an Ostrich's egg ! And she was quite surprised on hearing that. We also saw some tiny monkeys. The monkeys were very small in size. They looked like a bonzai version of monkeys. A girl with an American accent was giving information about them and was answering the questions asked by audiences. I remember an Indian guy aged around 21 to 24 asking a super intelligent question to her. He asked, "I see a ball lying in that corner", in a very serious tone. The girl said "Oh I see..". She then paused and didn't know what to say but eventually said, "One of the monkeys must have thrown it there. Let it be there" ! After this we went to a place which was filled with loads of small and colourful birds. Overall, it was a very good trip and just for 20 pounds! It was really worth the money. 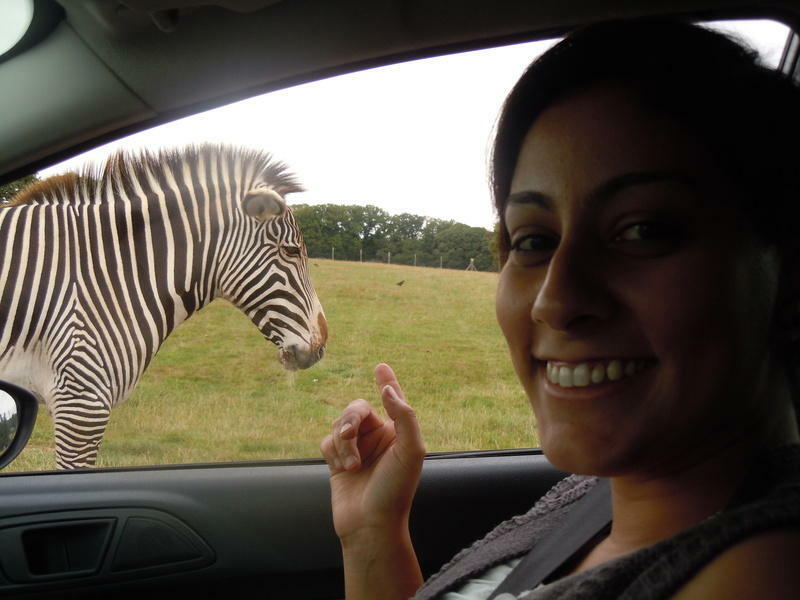 Where is Woburn Safari located ? Our pricing and opening hours vary throughout the year. Please check in advance of your visit. Online bookings must be made by midnight on the day before your visit. Family Tickets - Buy online and enjoy a full day of family fun for £52 - a discount of £6 off of the gate price shown below and £12 off single tickets. Ticket admits two adults and two children travelling in the same vehicle. Discount is applied at time of purchase. Single Tickets - Buy online and receive a 10% discount off of the gate price shown below. 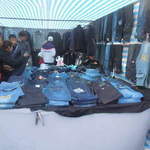 Discount is applied at time of purchase. Please note that promotional vouchers and Tesco Clubcard vouchers cannot be used to purchase on-line tickets. *Online bookings are not available at the Craft Fair due to the reduced entry price for this event. Vouchers and Tesco Clubcard vouchers cannot be used on this weekend. Unlimited circuits of the Road and Foot Safari's. 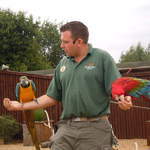 Keeper talks, animal feeding times and demonstrations. Free information leaflet including maps and timetables. 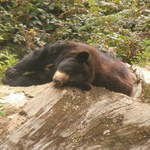 Online bookings must be made by midnight on the day prior to your visit. High & Main Season tickets purchased online are only valid for the year of purchase. 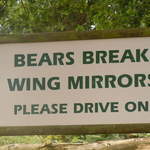 For further information please contact the Safari Park Office. 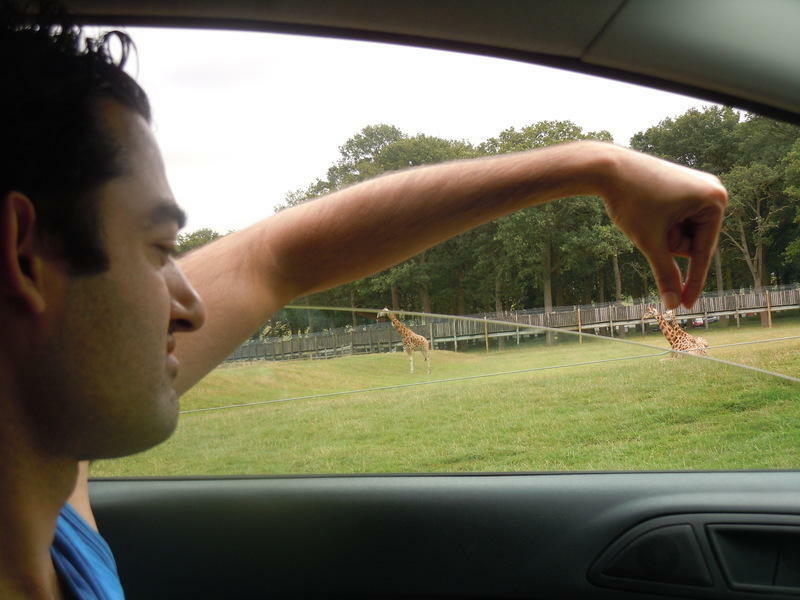 See which option suits your visit to the Safari Park. Adult - tickets apply to those aged 16 years and over. Senior/Concessions - tickets apply to women and men aged 60+ years of age. Students will be asked to produce a Valid NUS card on the day of visiting. Failure to do so will incur a surcharge to the full adult rate. Child - tickets are for children aged between 3-15 years old, children 2 and under are free of charge. Disabled - the rate is £7.00 per person for disabled visitors who are holders of a blue badge or from registered disabled care homes, nursing homes and hospices. This rate also applies to the carers, with a one to one ratio. 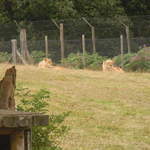 To obtain this rate, proof of official identity and details of the group is necessary by way of a letterhead to be retained by Woburn Safari Park. Enjoy a full day of family fun for just £52*. Price admits 2 adults and 2 children (3-15 years old) travelling in the same vehicle. *online price. 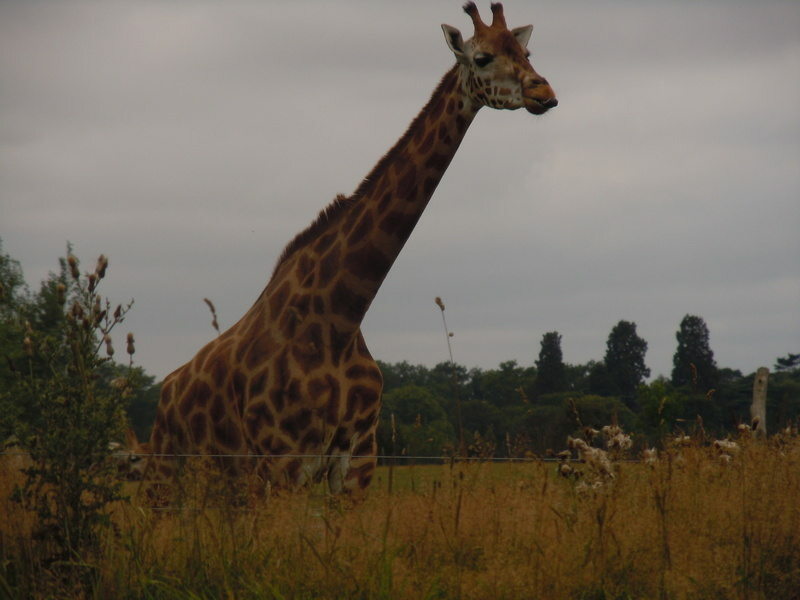 There's too much to do at Woburn in just one day, so we have designed a Passport ticket so that you can visit both great attractions, Woburn Abbey and Safari Park, once during the same year and save money! 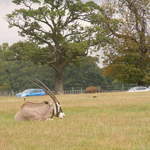 The Passport Ticket will be available to purchase from March 2010 when Woburn Abbey reopens for Main Season. The Annual Ticket is great value, allowing members to visit as often as they like throughout the season, at winter weekends and February half term. You can buy an annual ticket on the same day as your visit - the individual admission fee for the day will be refunded for each individual buying a ticket. This cannot be used in conjunction with any other vouchers or Tesco Clubcard offers. Guests of annual pass holders can also enter at a discounted rate. Toddler pass - Children under 3 enter free of charge on this pass, with one accompanying adult also included to supervise! 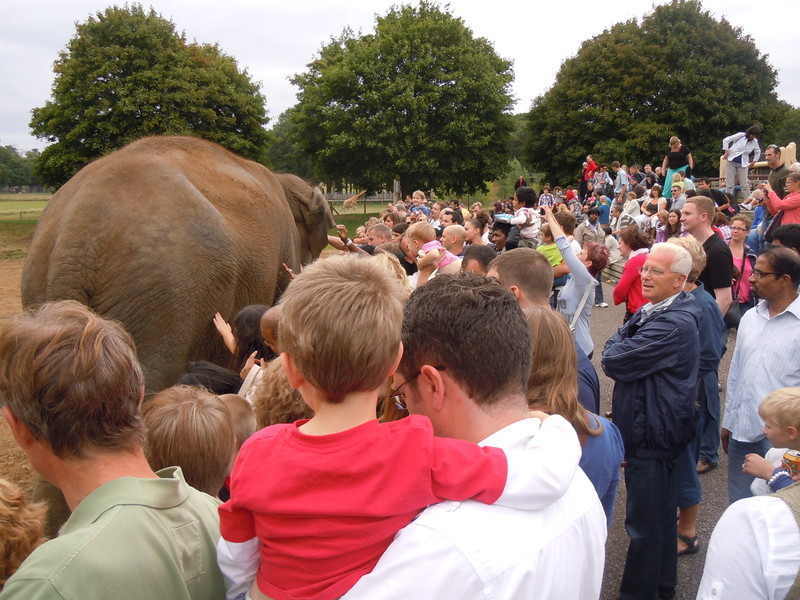 This is a reduced rate for groups wishing to visit Woburn Abbey and Woburn Safari Park on the same day. Party rates apply to groups of 12 or more paying visitors in one minibus or coach. 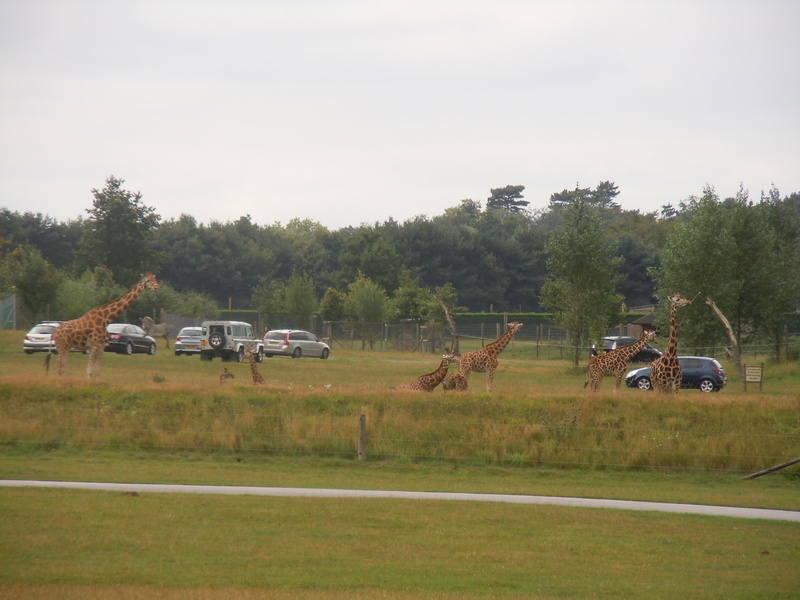 All visitors on the same minibus or coach must have the Woburn Experience joint ticket for both Woburn Safari Park and Woburn Abbey. Coach drivers only are free of charge. Guided tours are available (at an additional cost and subject to availability). 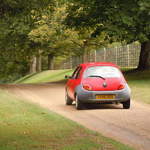 Pre-booking is necessary with Woburn Abbey Admissions Office. 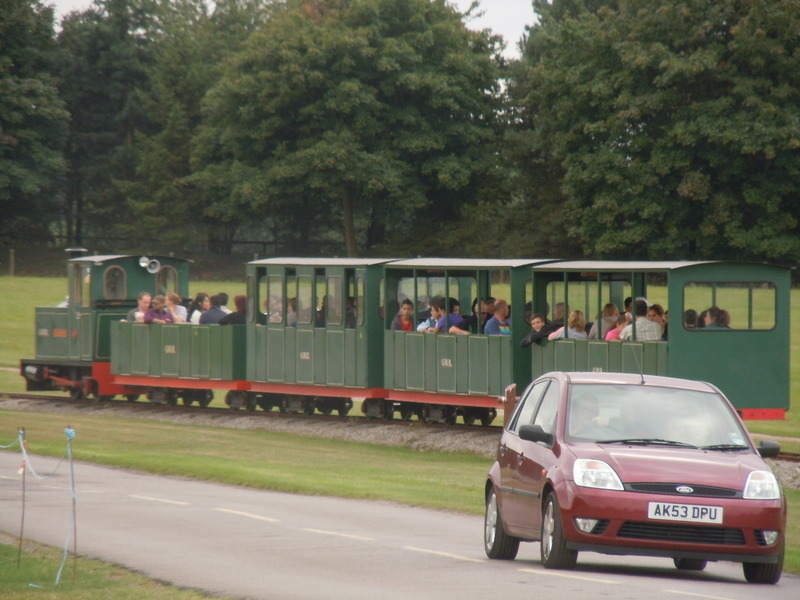 A group must have 12 people or more travelling in a minibus or coach. This rate is NOT applicable to cars. There is no charge for the group organiser or the coach driver (this applies to coaches only). Group rates do not apply during winter weekends. Special rate on offer to official children's groups such as nursery groups, play schemes, youth groups, summer schools, after school clubs, rainbows, brownies, guides, beavers, cubs and scouts. To obtain this rate authorisation must be given from the Education Department and a confirmed booking made prior to the date of your visit. 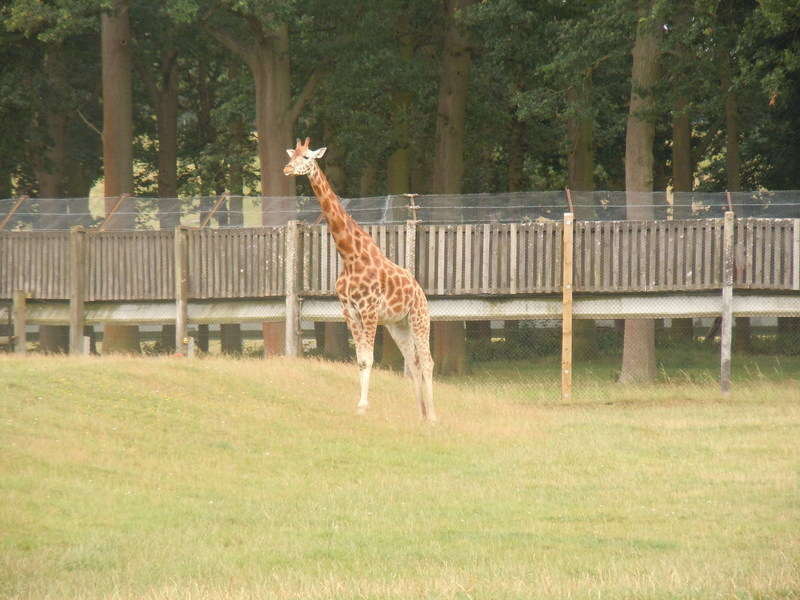 Woburn Safari Park is a fantastic venue for school groups of all ages! It combines learning with an enjoyable experience. 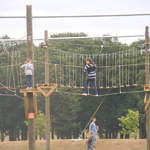 School groups can make their own way around the Park or opt for an educational activity. Rates available to official schools only and are applicable to groups of 12 or more visitors travelling on coaches or minibuses (not applicable to cars). Rates only available during Bedfordshire term time. School groups must book in advance to get this rate. If you're planning a wedding, occasion or corporate event, the Safari Lodge provides a unique experience. Keep up-to-date with offers at Woburn by signing up to our email newsletter. 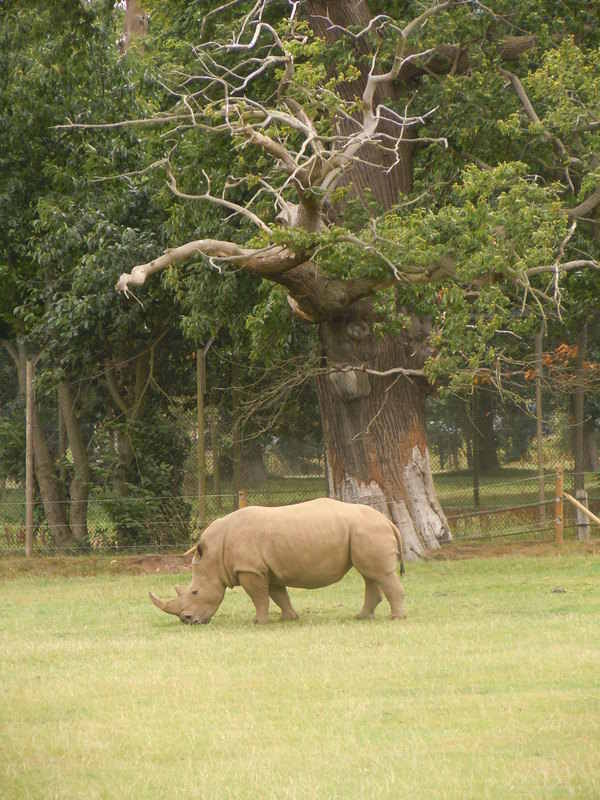 Click here to download and print the voucher, which can be redeemed in the Safari Restaurant or Two by Two Restaurant at Woburn Safari Park. 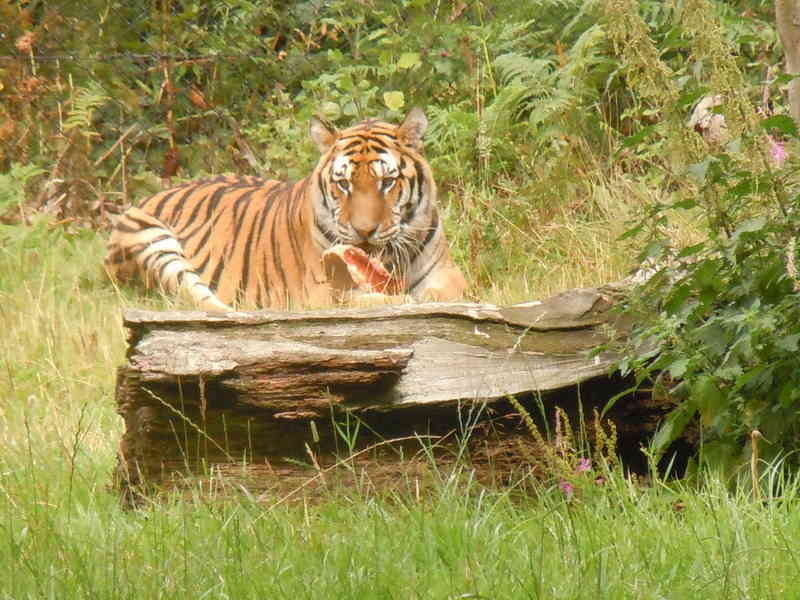 Click here to download and print the voucher, which can be redeemed in Jungles Gift Shop or the Trading Post at Woburn Safari Park. Whether you are a coach operator, school, college, or special interest group, we invite you to join us at Woburn. We can combine any tour option and tailor it just for your group to ensure your group visit is a day to remember. 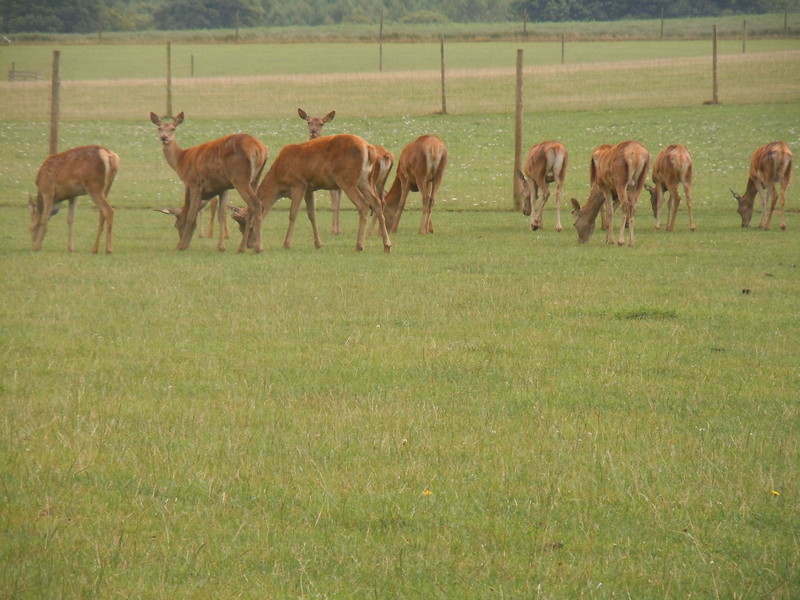 Set in a beautiful 3,000 acre deer park, Woburn Abbey has been home to the Dukes of Bedford for over 300 years and is now occupied by the 15th Duke and his family. Enjoy stunning works of art, recognised as one of the world’s finest private collections, including famous pieces by Gainsborough, Reynolds, Van Dyck, Cuyp and Gower and the largest collection of Venetian views painted by Canaletto in the UK, second only to the Royal Collection. View captivating antiques and personal items treasured throughout the centuries. Discover fascinating Woburn and its part in English history, the origins of Afternoon Tea and tour the peaceful gardens. Touring the Abbey covers three floors, including the Gold and Silver Vaults. 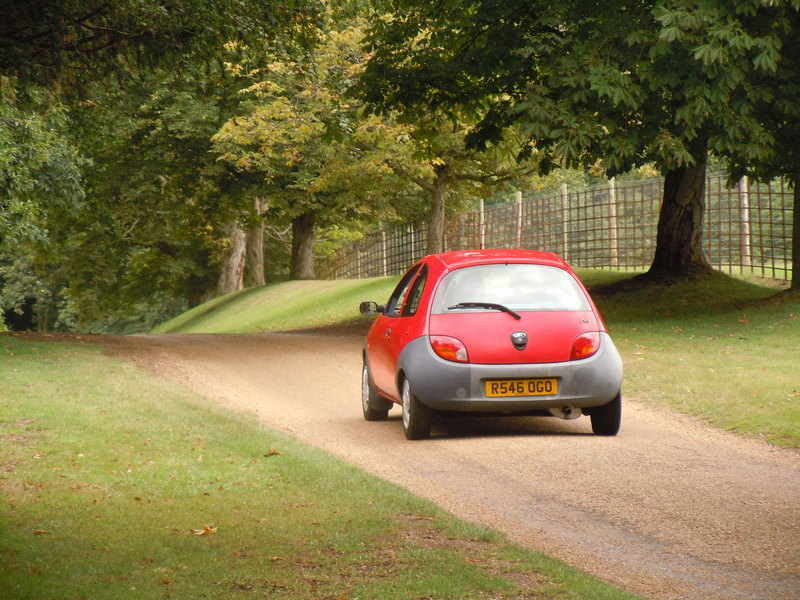 Within the grounds there are 22 acres of gardens, the superb Woburn Abbey Antiques Centre (covering 11,000 sq ft, representing over 40 dealers), the Pottery, the Duchess’ Gift Shop and the Duchess’ Tea Room. 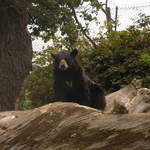 Designated picnic areas within the park and grounds are available. The tranquil Abbey Gardens were the inspiration of Humphry Repton, the famous landscape gardener of the early 19th century. Enjoy both formal and natural garden environments: from manicured lawns and flower beds to woodland, glades and lakes. Follow the Garden Trail to find out more about what you can see in the gardens today and the redevelopment over the past five years to recreate and replant Repton’s original features and themed garden areas. 2010 is the 200th anniversary of the completion of Repton’s plans at Woburn Abbey. The official opening of the restoration of his original Pleasure Grounds and a season of special events will commemorate this exceptional occasion. This will include a new exhibition on Repton, opening a section of the private gardens, entry to the 19th century Hornbeam Labyrinth and masterclass sessions (selected dates). 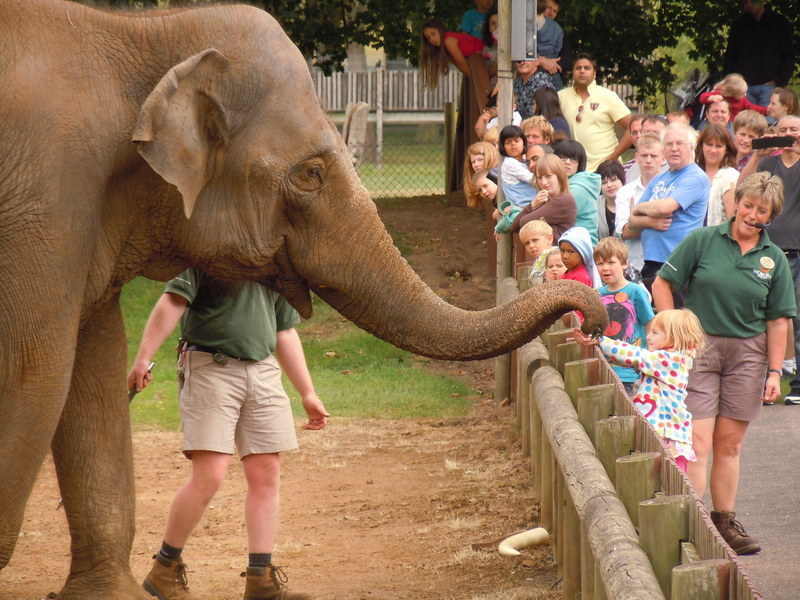 With over 800 animals, Woburn Safari Park is a full day out for all ages and all the attractions are included in the entry price. 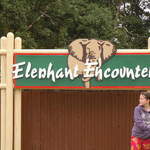 Combine the experience of the Safari drive with the fun and close animal encounters of the Wild World Leisure Area. 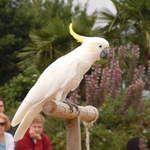 Meet the animals in Land of the Lemurs, Australian Walkabout and Animal Encounters and the lorikeets in Rainbow Landing. 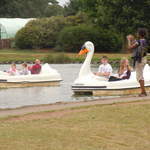 Children can let off steam in the Mammoth Play Ark (an indoor soft play area), the adventure playgrounds, on the swan boats or by taking a ride on the Great Woburn Railway. 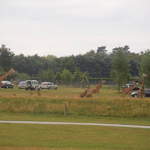 2010 is the 40th anniversary of the Safari Park and visitors will be able to join in the celebrations with a series of special events throughout the year. 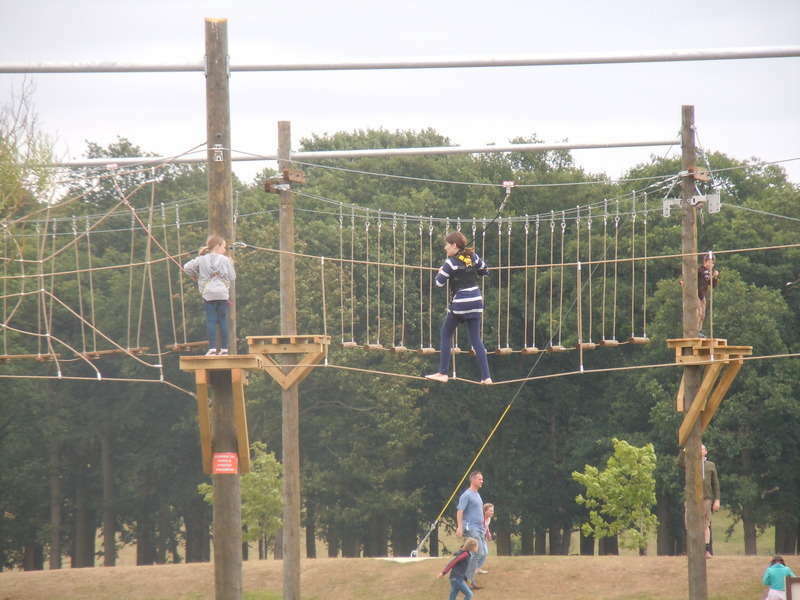 Experience all that Woburn has to offer with our joint ticket to Woburn Abbey and Gardens and Woburn Safari Park. 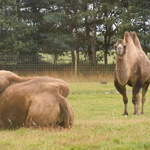 Visit the award winning Safari Park for the exciting thrill of going on safari. 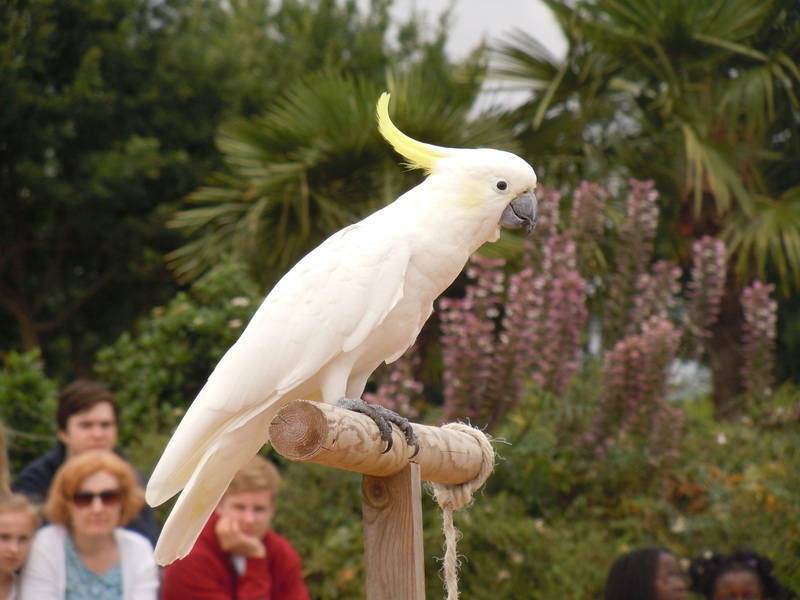 Tour one of the great Treasure Houses of England and saunter through the serene Abbey Gardens. Available to pre-booked groups only. 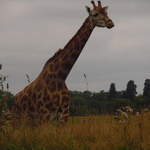 Make great savings on our Safari Guide Book, Abbey Audio Tour and Abbey Guide Book when you pre-book your group visit. Whether you want a hot meal, a snack, afternoon tea or an overnight stay there are many different options for group bookings at Woburn. Group lunches can be booked in the Safari Restaurant, Duchess Tea Room or at the award-winning Olivier’s Restaurant at the Inn at Woburn. Situated in the heart of the attractive Georgian Village, the Inn at Woburn provides a convenient place to meet and offer high standards of service and hospitality. The Inn has 50 bedrooms and 7 cottages. Already coming on a group visit/tour? Plan your visit and make sure you don’t miss a thing. 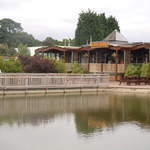 Concerts, rallies, fairs and displays....Woburn is renowned for its full and varied calendar of events throughout the year and offers entertainment to suit all ages, tastes and interests. Teacher pre-visit vouchers (one per class) are available. Please request at time of booking. Rates available in advance only to official schools only for groups of 12 or more visitors travelling on coaches or minibuses (not applicable to cars). Rates only available during Bedfordshire term time. Risk assessments are also available at time of booking. See the Education section for further information. Special rates are available to official children's groups. 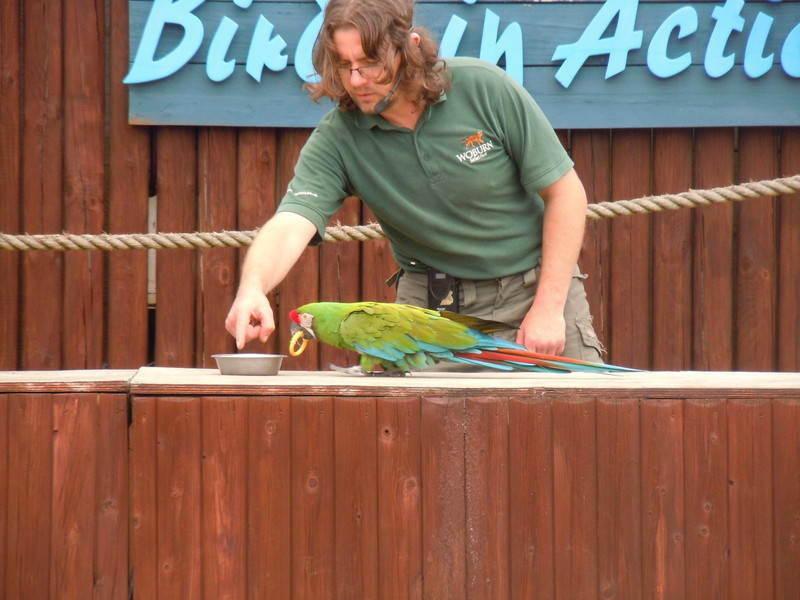 The discounted rate of £7 applies to a limited number of adults. Details given on booking. Group organiser and coach driver admitted for free. This rate is only available to official children's groups: nursery or pre-school groups, youth groups, play schemes and summer schools, after school clubs, brownies, rainbows, guides, scouts, beavers and cubs. It is not open to general or family groups, even if there is a large number of children. If you think your group may qualify, please call (01525) 290991. There must also be a significantly greater number of children to adults to qualify for this rate. To receive this rate, groups must book in advance. Failure to pre-book will result in groups being charged normal group rate. 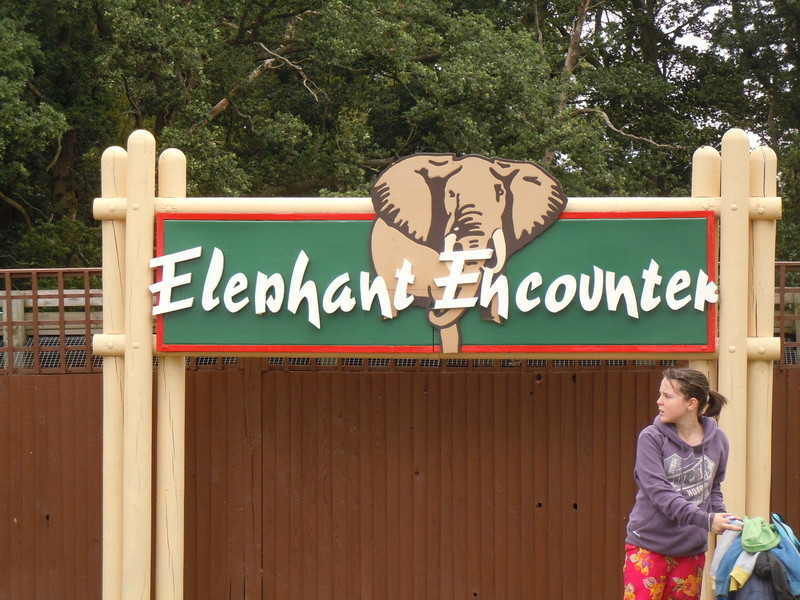 Please call (01525) 290991 or email education@woburnsafari.co.uk to book. We can also provide details about school visits. In the On Foot Safari area you are never far from a cart or kiosk that sells a range of ice creams, soft drinks and other snacks. The Safari Restaurant offers you the chance to enjoy a relaxing meal or light snack. Group lunches must be pre-booked in the Safari Restaurant to ensure availability - there is a discount of 10% for pre-booked groups of 25 people or more. 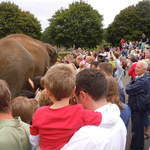 There are a variety of different tickets available for Woburn Safari Park, all at excellent value for money. 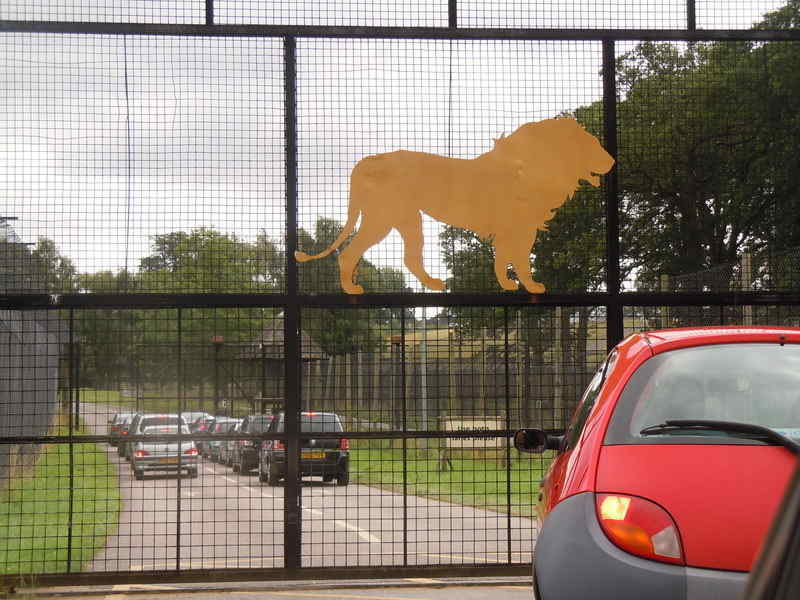 The fast way to pre-book your tickets for Woburn Safari Park. Follow the process on our secure site to purchase discounted tickets in advance. Online bookings must be made, at the latest, by midnight of the day before you visit. Book online now! 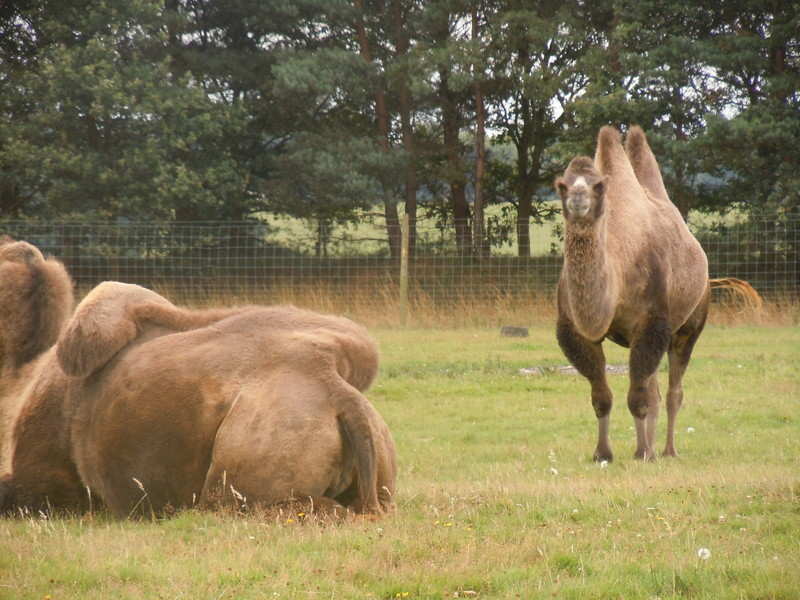 Tickets for the same day can be purchased during normal opening hours at the Safari Park. Please go directly to the admission lanes at the main entrance on arrival. Please ensure that your voucher is in date and appropriate to the time of your booking and the venue. We cannot accept photocopies or out of date vouchers. Vouchers and Tesco Clubcard Vouchers are not applicable for selected events through the season. Please check before booking. We cannot accept vouchers for on-line bookings. 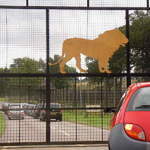 No pets or dogs are permitted into the Safari Park and kennel facilities are not provided. 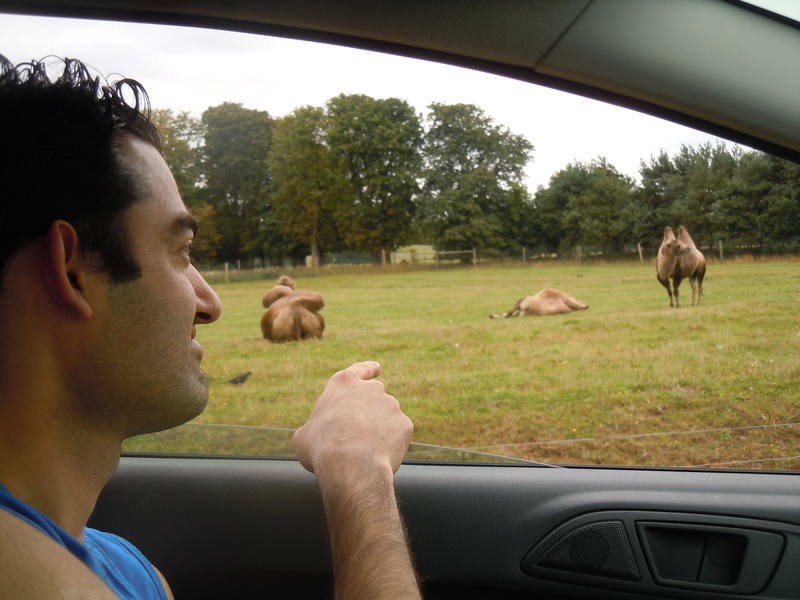 Soft tops and convertibles are allowed in the Safari Park. 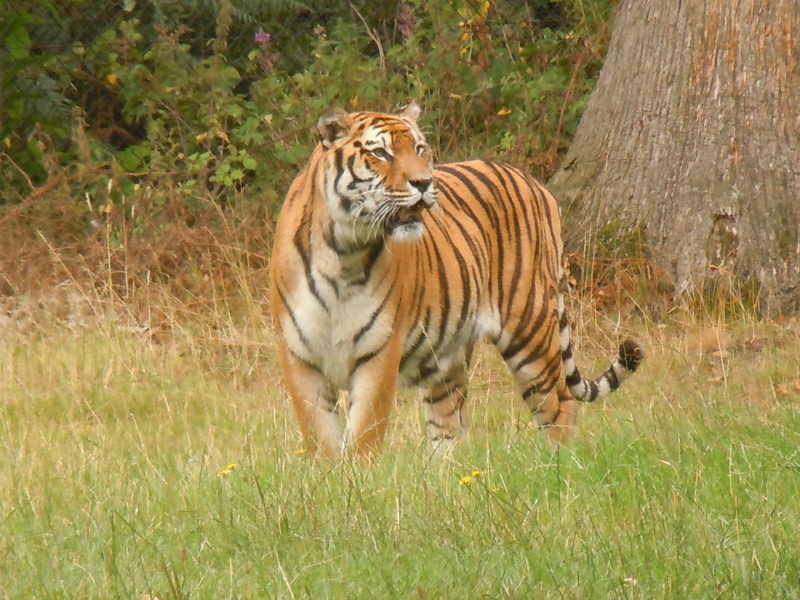 However there are restrictions - they cannot enter Tigers, Bears & Wolves, Lion Park or Monkey Jungle. Standard admission applies. 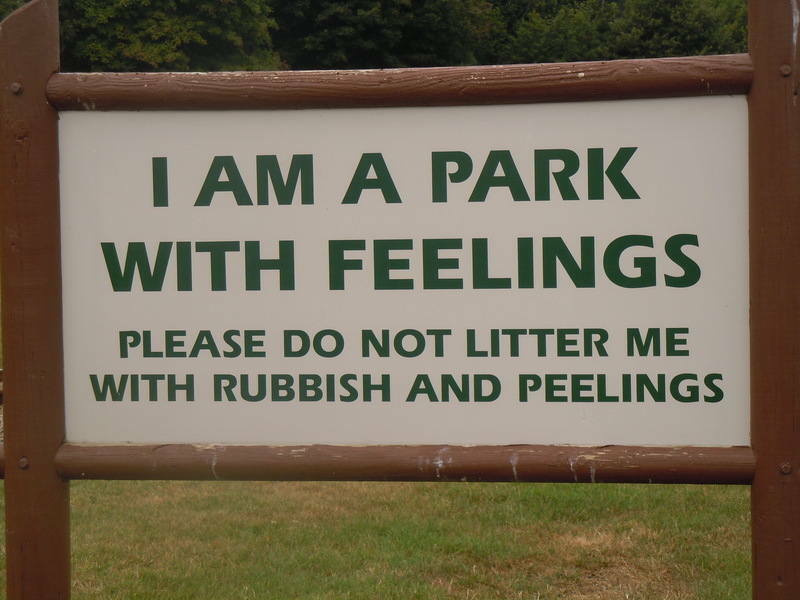 The Park is a non smoking area and smoking is not permit anywhere within the Park walls. 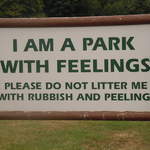 No motorbikes and barbeques are allowed in the park. 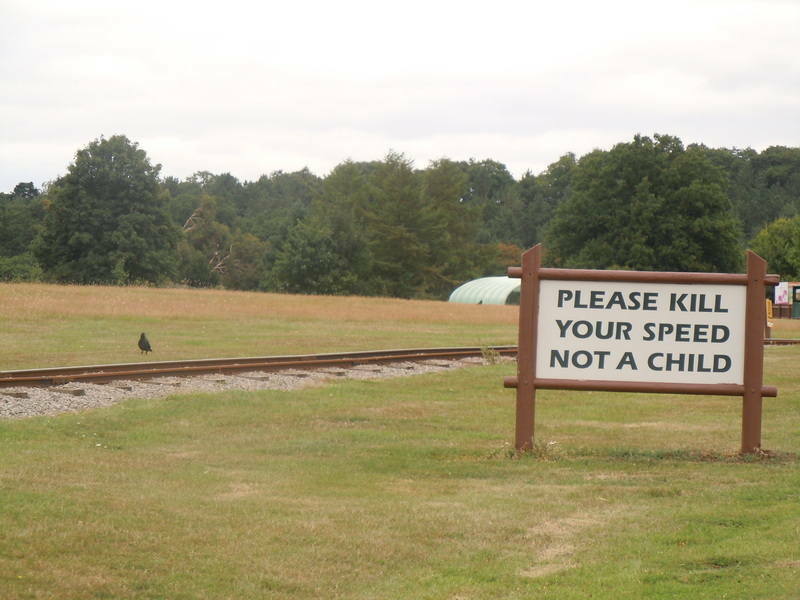 The speed limit in the Park is 15 mph and must be kept to at all times. 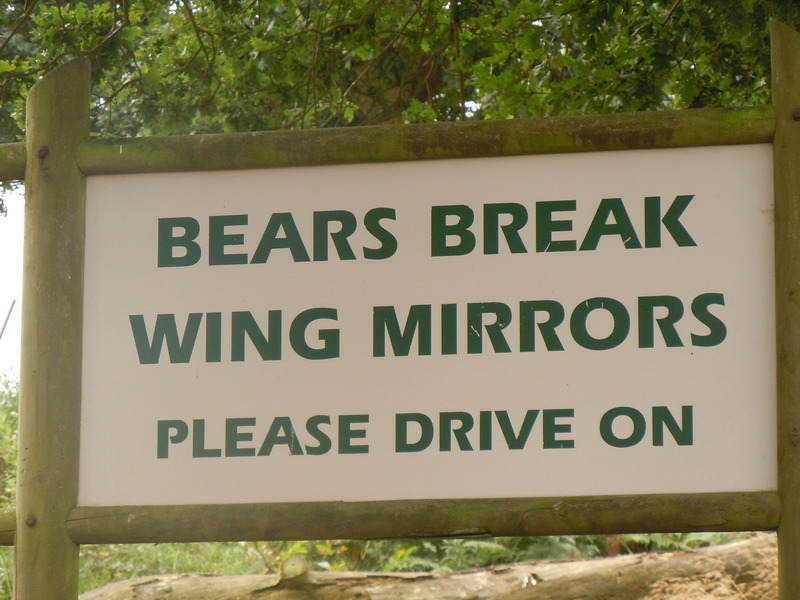 Once within the animal reserves you must stay in your vehicle AT ALL TIMES. If you have any problems then please sound your horn and wait for assistance. 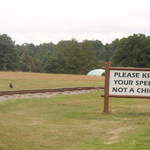 Woburn Safari Park reserves the right to ask any participant to leave the site should they behave in an inappropriate or unsafe manner. 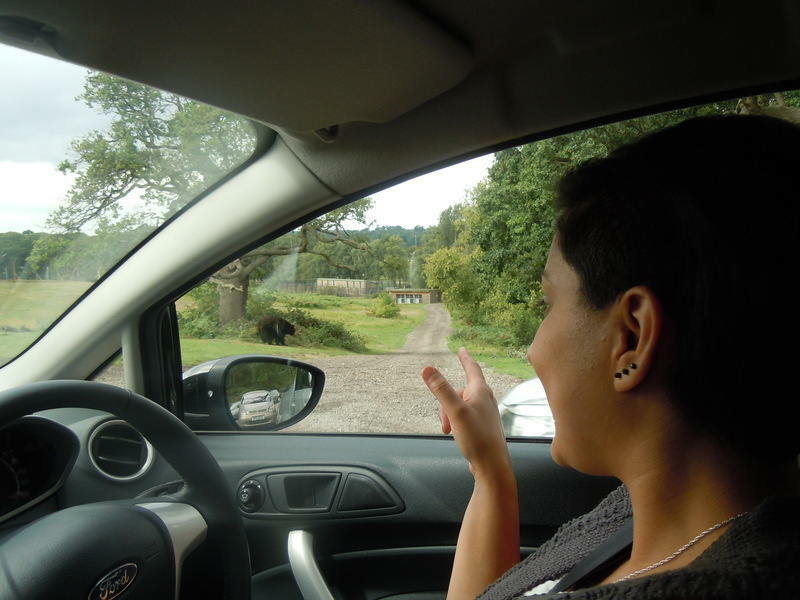 When visiting Woburn Safari Park you MUST travel around the Park in your own vehicle. Transport will not be provided unless you are taking a VIP Tour. Beat the queues and buy your tickets online. 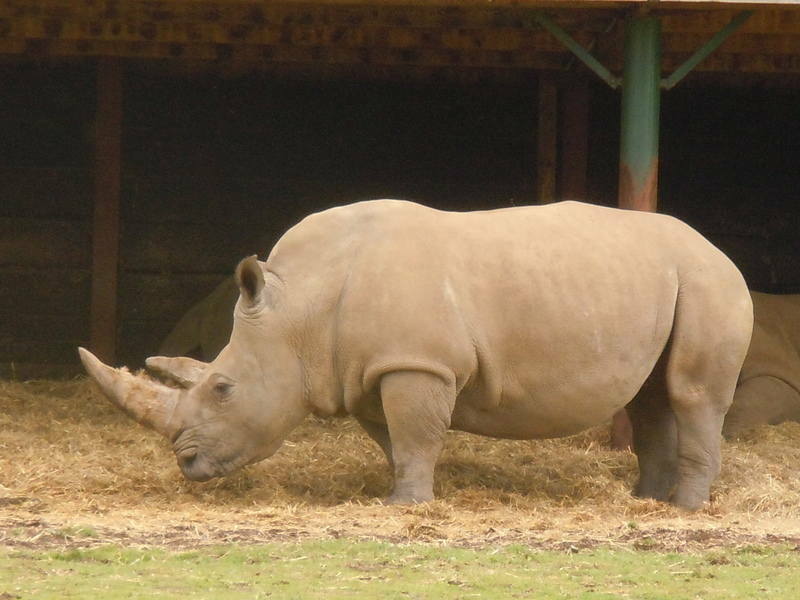 Once you have enjoyed your Road Safari at Woburn, why not relax in the Wild World Leisure Area where you can find the various places to enjoy a break, refuel and then visit more animals! 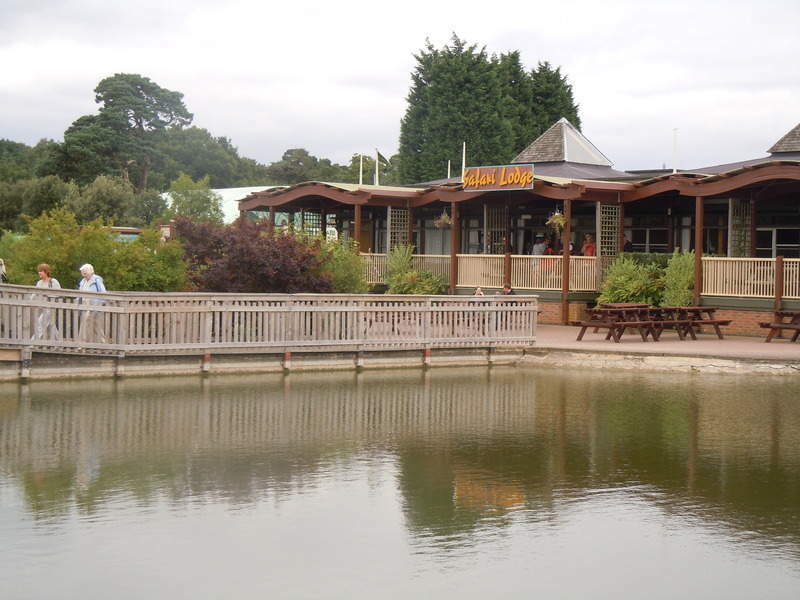 Hot and cold meals and snacks are available at the Safari Restaurant - the Safari breakfast and roast chicken are always popular, as well as pasta dishes, salads and jacket potatoes. Hot and cold drinks, ice creams and confectionery are also available. 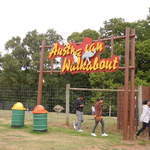 This popular restaurant is based in the Mammoth Play Ark and is fast food style, but also has healthy options on offer. Piri Piri chicken is very popular in wraps, with salad in pitta bread or choose a burger. There is also a family meal offer and children's meals options plus a range of hot and cold drinks. Open weekends and school holidays 12noon to 5pm. Open weekdays for snacks and drinks 12noon to 3pm. Available for Children's Parties and exclusive private hire after closing time. 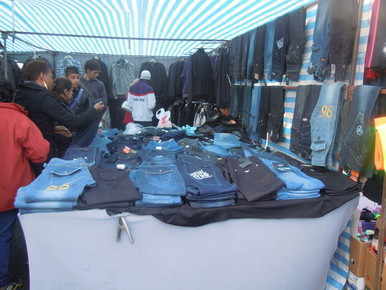 Kiosks sell hot and cold drinks, ice creams, muffins and confectionery. Badger Kiosk also sells hot dogs. Open holidays and weekends only. Open during school holidays only March to September. In the Foot Safari area you are never far from a cart or kiosk that sells a range of ice creams, soft drinks and other snacks. The tradition of taking Afternoon Tea first originated in Woburn Abbey. It was the 7th Duke's wife, Duchess Anna Maria, who decided as it was too long to wait between lunch and dinner, she would ask for some light sandwiches, cake and a pot of tea. On the day of your visit celebrate this fine tradition by treating yourself to the Duchess Anna Maria Afternoon Tea at the Duchess' Tea Room within the Abbey grounds or at the estate's hotel, the Inn at Woburn, in the heart of Woburn (The Duchess Anna Maria Afternoon Tea must be pre-booked). The Duchess' Tea Room also offers many delicious treats and tasty meal options with daily specials and homemade cakes and a wide selection of Suki teas to chose from. Our excellent Time for Tea package includes the delicious Duchess Anna Maria Afternoon Tea at the Duchess' Tea Room or the Inn at Woburn, alongside entry to Woburn Abbey, the Deer Park and Grounds (for pre-booked groups only). 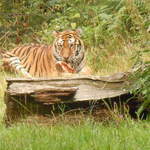 For details on group visits, packages and booking please see our Groups Tour Options information. 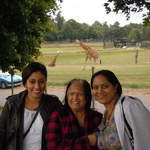 Buy a Passport ticket and you can visit both Woburn Safari Park and Woburn Abbey once during the season and save money! Check the special offers currently available. The Duchess' Tea Room is open weekends in March and then daily 4th April to 4th October. With 2 AA Rosettes, Olivier's Restaurant at The Inn at Woburn, is the hotel's award-winning restaurant. Head Chef, Olivier Bertho, provides a superb menu of contemporary English and continental cuisine, served with flair and imagination. Enjoy a wonderful meal in elegant surroundings and a relaxed atmosphere. Served in Olivier's Restaurant Monday to Saturday 6.30pm to 9.30 pm. Served Sunday in Olivier's Restaurant 12.30pm to 4pm and 6.30pm to 9.30pm (last orders). Our extensive wine list offers something for every palate and pocket. 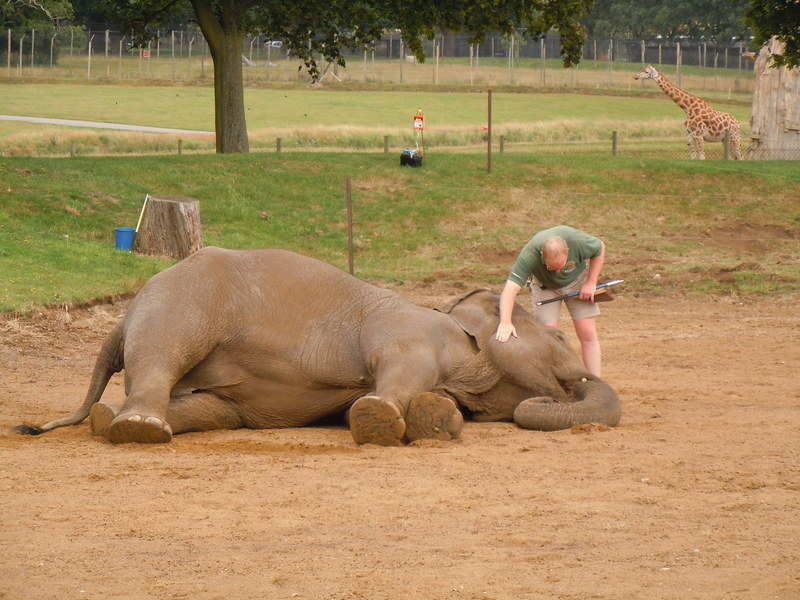 How to get to Woburn Safari ? 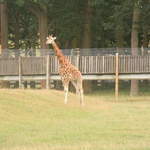 From the M1 - Follow signs to Woburn Safari Park from the M1 junction 12 or 13. 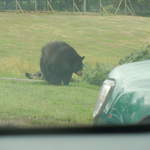 From the A5, follow signs to Woburn village. 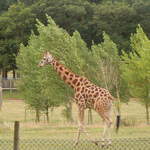 Woburn Safari Park is signposted from here. For Satellite Navigation systems please enter MK17 9QN, Crawley Road.